The 2016 version of the RX8 was a long time in the making. Planning, research, testing, and ingenuity… all of these were combined to bring the RX8 to an entirely new level of performance. Crucial strategic decisions were made and acted on to accommodate new changes & rules in the 1/8 on-road class. Development at XRAY never stops, nor does our pursuit of perfection. Evolving the RX8 to its present state has been a challenge for me and everyone at XRAY, and this new, re-designed version of the RX8 incorporates all the best features and ideas gathered over the past years. The long wait is over, behold the all-new RX8. The road to realizing my dream was often filled with challenges, twists & turns, revelations & victories. Such was the literal truth in my pursuit of the ultimate racing machine, fuelled by passion and vision… a dream realized as the RX8. 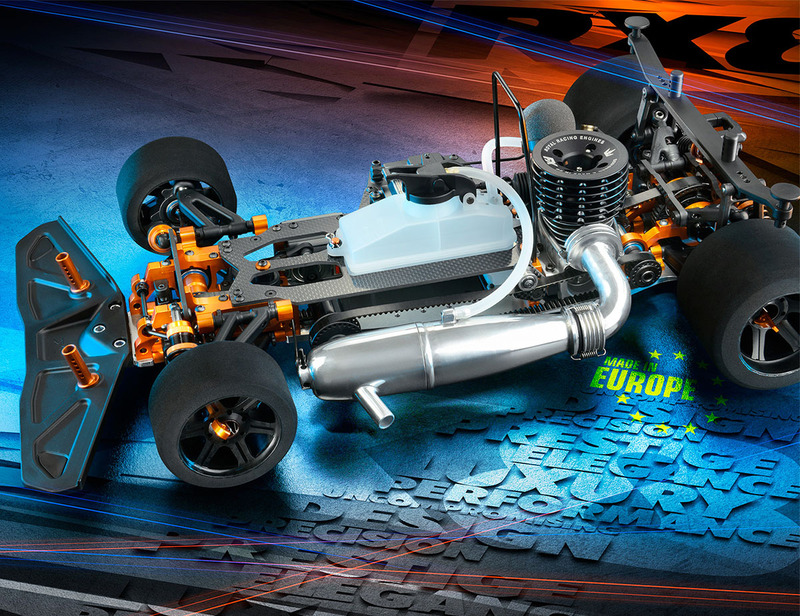 With a full stable of nearly every imaginable RC car in the XRAY line-up, the center stage held an empty spot for a new flagship to showcase XRAY ideals, philosophy, and commitment to racing perfection. 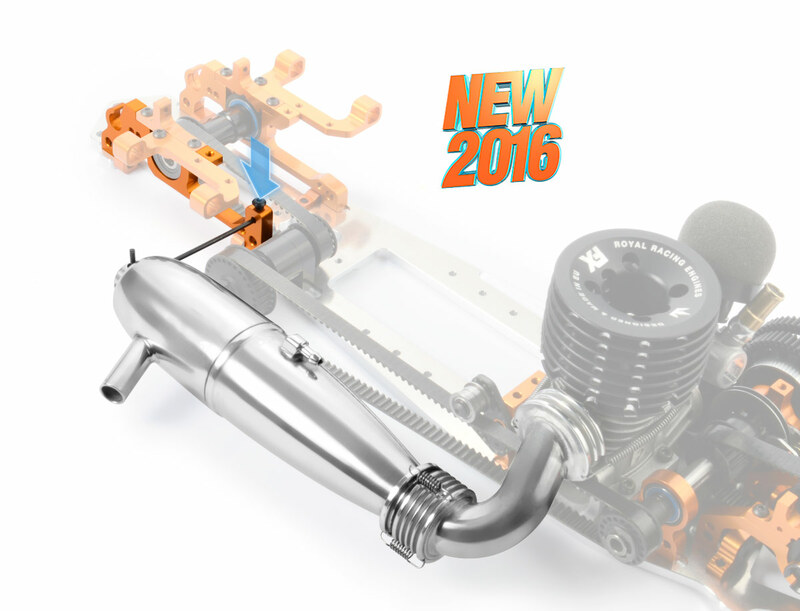 Learn more about the development of the RX8'16. 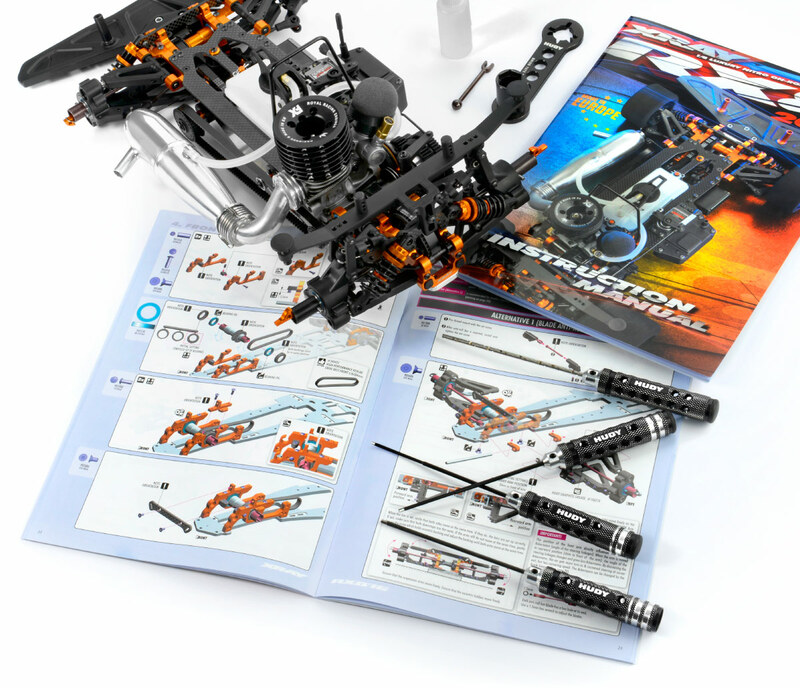 The RX8 is a typical XRAY car - a premium, professional, high competition model racing car for the most demanding racers, developed and designed with attention to the smallest details. Manufactured from premium European materials, machined using state of the art Swiss and German machines and backed by premium service & support, the RX8 is a typical XRAY, a luxury masterpiece. Smooth flowing lines, distinctive design touches, all sculpted in lightweight platform - an expression of power, dramatic styling, superior technology, pure luxury and performance. With XRAY's uncompromising design philosophy bringing everything together to make the best nitro on-road car, the RX8 has the unique XRAY character, born of precision craftsmanship and highest attention to detail. For drivers with an irrepressible drive to win, the RX8 is the answer. The ultimate expression of racing passion. The art of performance. RX8. Borne of childhood passion and developed from my 37-year heritage of dedication to engineering ingenuity, the RX8 was crafted for one purpose: to be the definitive representation of XRAY craftsmanship and sophisticated engineering. My quest for realizing the dream has involved the full range of the substantial resources at XRAY’s disposal: concept & design, research & development in virtual and physical reality, and rigorously thorough testing before the RX8 races out of the stable and into the arms of the eagerly waiting world. Joining its brethren in the XRAY family, the RX8 is positioned to capture the hearts and minds of the racing world, and carry them into the Winner’s Circle. 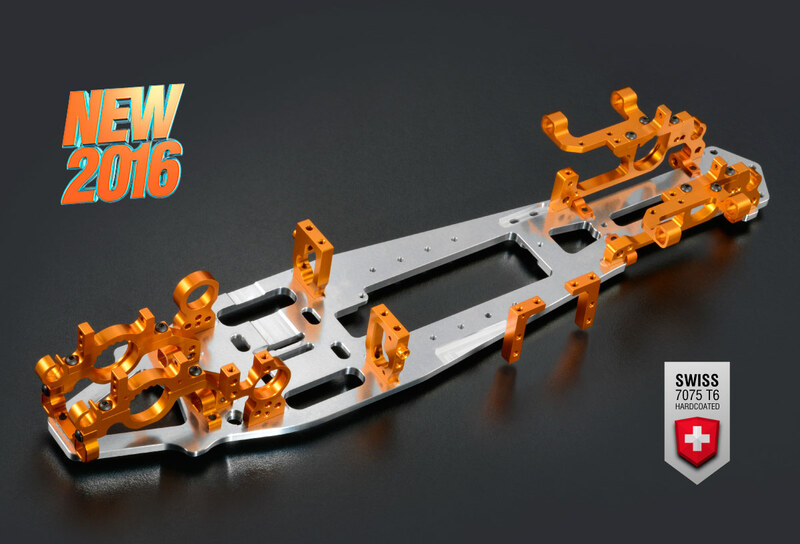 The most significant change to the latest RX8 platform is the all-new aluminum backbone. The main frame and backbone of the car consist of high-precision aluminum bulkheads and aluminum suspension holders that are mounted to the aluminum chassis. All bulkhead parts are CNC-machined from premium Swiss 7075 T6 aluminum and have been designed to provide the lightest and strongest possible support framework for the car with maximum flex characteristics for increased traction. 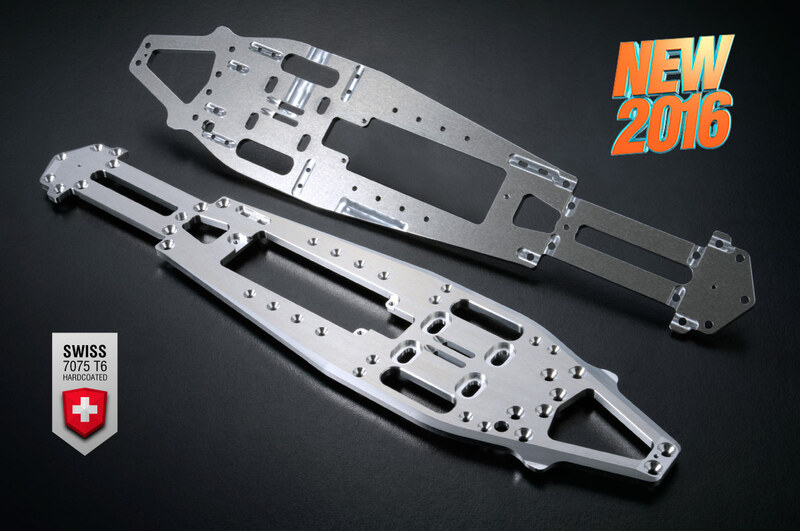 The RX8 chassis has been re-designed to accommodate the new aluminum bulkheads and suspension holders. 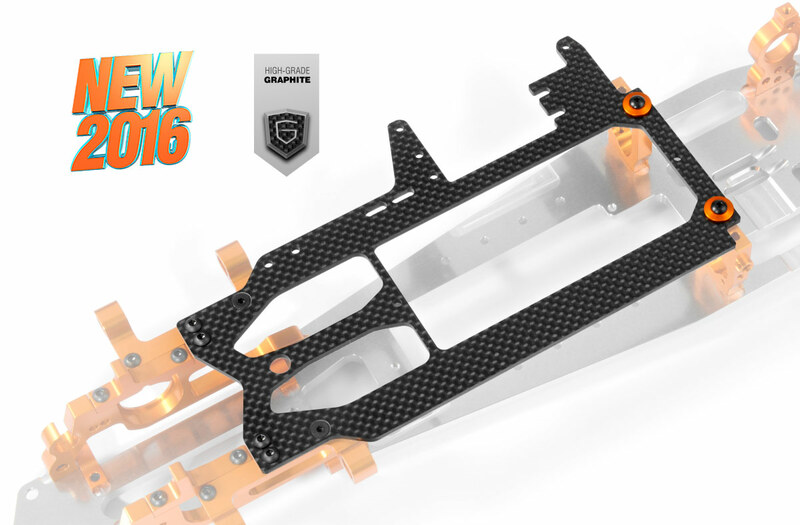 The chassis has enhanced performance in the corners and provides great stability. 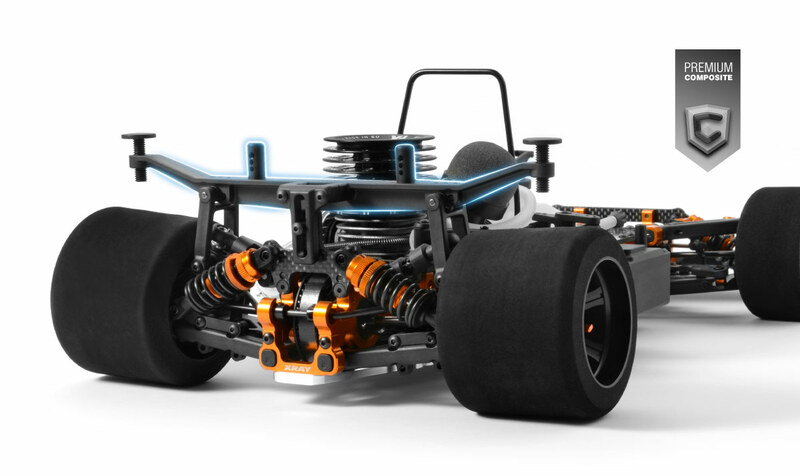 Overall, the chassis is very narrow to increase chassis flex and generate more traction and steering. The narrow chassis also prevents chassis contact in corners and helps to eliminate the feel of the car ‘stopping‘ in mid-corner. 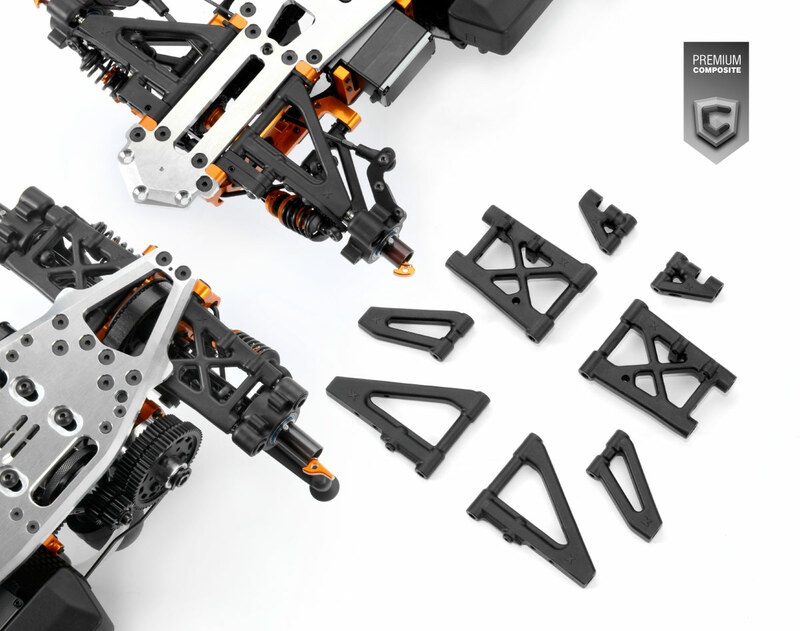 The lightweight chassis is CNC-machined from 5mm premium Swiss 7075 T6 aluminum and is strategically machined in low-stress areas to make it as light as possible without affecting strength or rigidity. 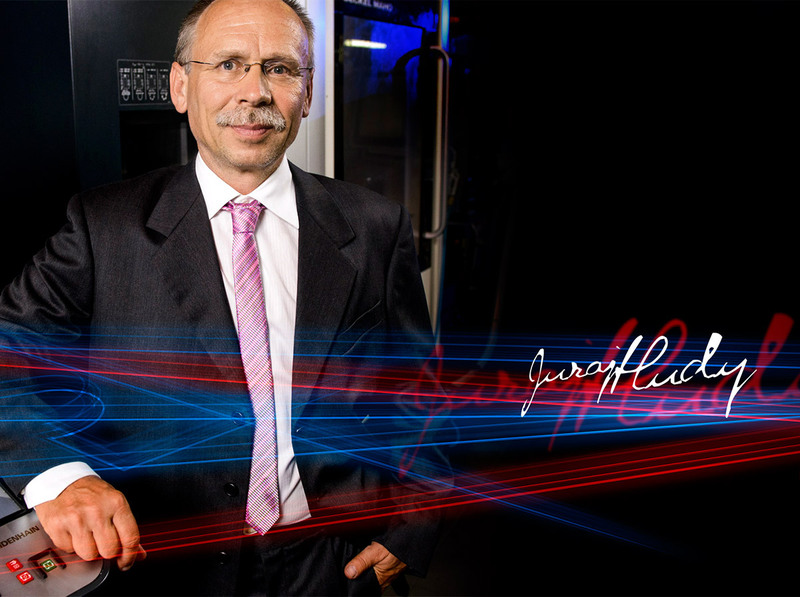 The chassis has strategic cut outs for optimized flex characteristics. The holes for the engine mounts are now centric and closer together for improved flex. The chassis features cut outs for all bulkheads, front lower arm mounts, radio plate mounts, and front shaft holder as well as rear layshaft bulkheads for perfect fitment and to ensure that all parts will always mount into the same position. The outer edges of the chassis have been beveled and screw holes have been countersunk to provide a smooth lower surface. One of the most significant changes to the latest RX8 platform is the all-new aluminum bulkheads. With changing rules moving to larger, harder tires, the traditional composite bulkheads were changed for aluminum. The new aluminum bulkheads provide improved stiffness & flex characteristics for better steering characteristics, even with hard spec tires. The super-lightweight Swiss 7075 T6 aluminum bulkheads have a very clean and lightweight design to give the lowest weight and CG, making the RX8 easy to service while still giving easy access to all parts. All-new aluminum rear 2-speed shaft bulkheads are separated from the rear bulkheads to give proper flex which translates into maximum traction. All ball-bearings are installed in composite bushings to eliminate transfer of vibrations from the engine. 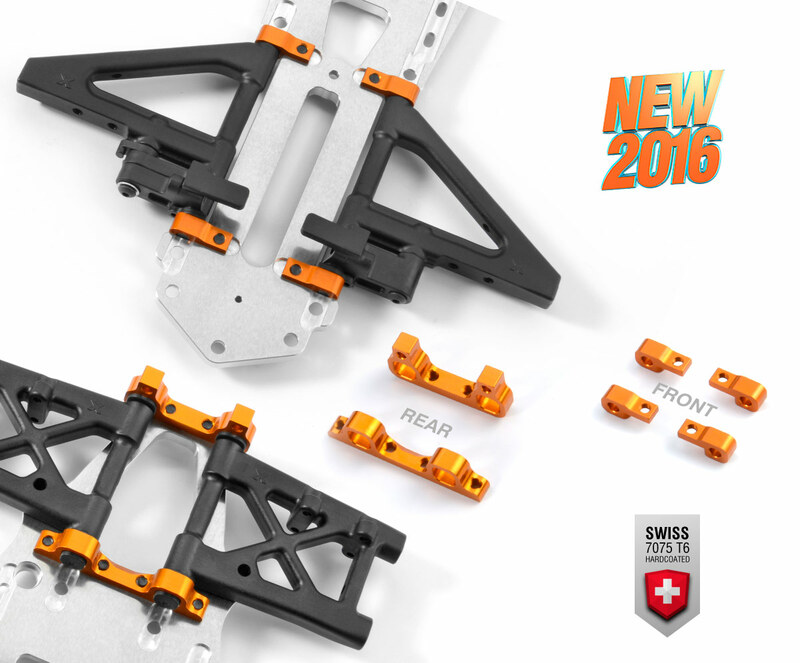 The bulkheads are CNC-machined from premium Swiss 7075 T6 aluminum to ensure the lightest & strongest support framework. The all-new rear upper clamps were re-designed to fit the new aluminum bulkheads. The rear Swiss 7075 T6 aluminum upper clamps hold the rear shock tower and the graphite upper arm holders. The all-new front upper clamps were re-designed to fit the new aluminum bulkheads. 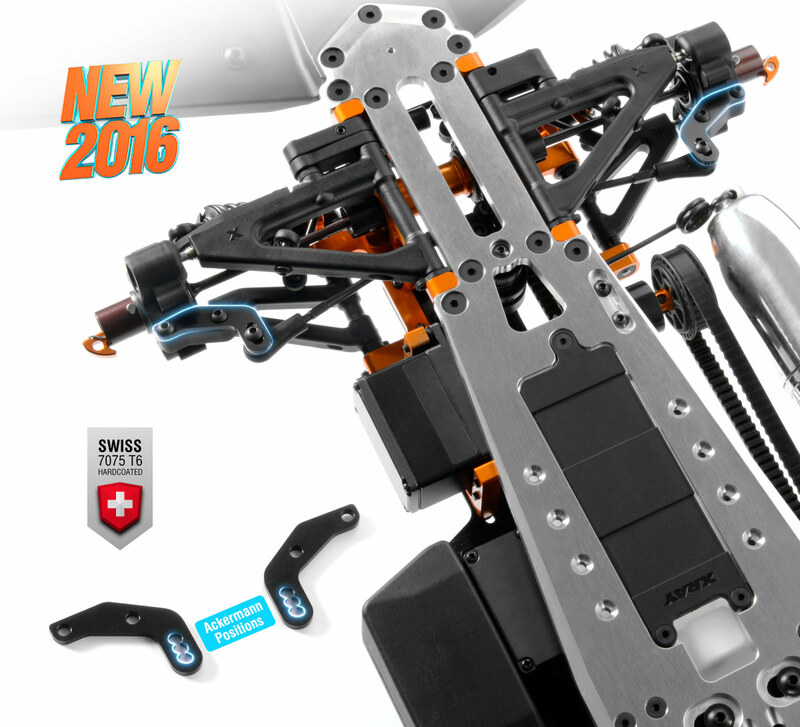 The front Swiss 7075 T6 aluminum super-lightweight upper clamps hold the front shock tower and the front upper arm mount and make the access to the front one-way super easy. 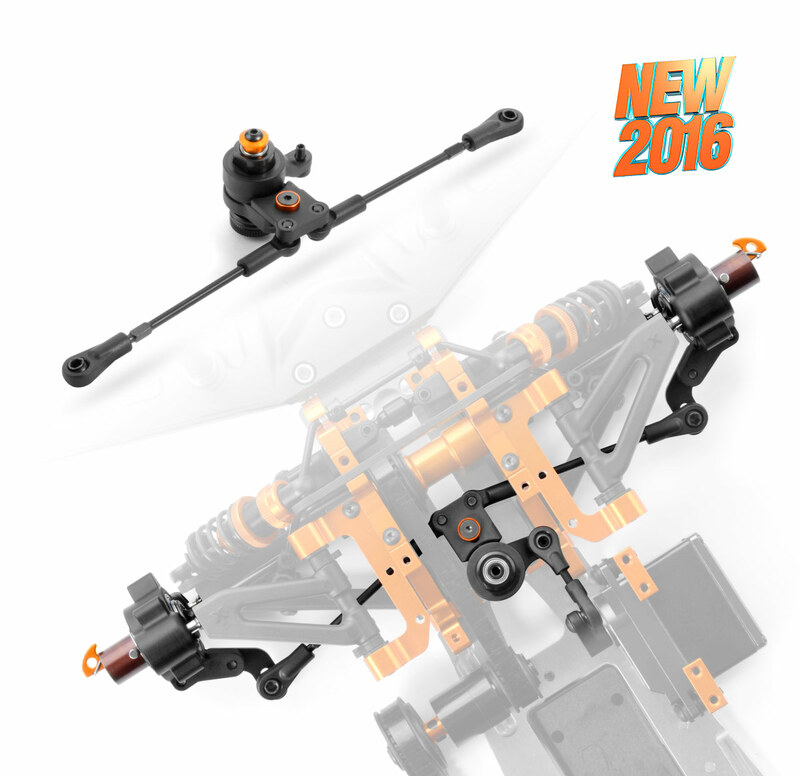 The all-new front upper arm holders were designed to work with the new aluminum bulkheads. Each upper front arm holder is mounted to the front upper clamp via a single screw and to the radio plate with two screws. This way, the front suspension has optimized flex for improved in-corner steering and better steering response. One of the 2 mounting screws of the radio plate may be removed for even more flex – as part of the Multi-Flex™ system. The Swiss 7075 T6 aluminum front upper arm holders were designed to allow the upper arms to be moved more rearward for increased caster angle and improved cornering speed. The aluminum front middle shaft holder was re-designed to work with the new aluminum bulkheads. The holder works now as a belt tensioner for the front & side belts. 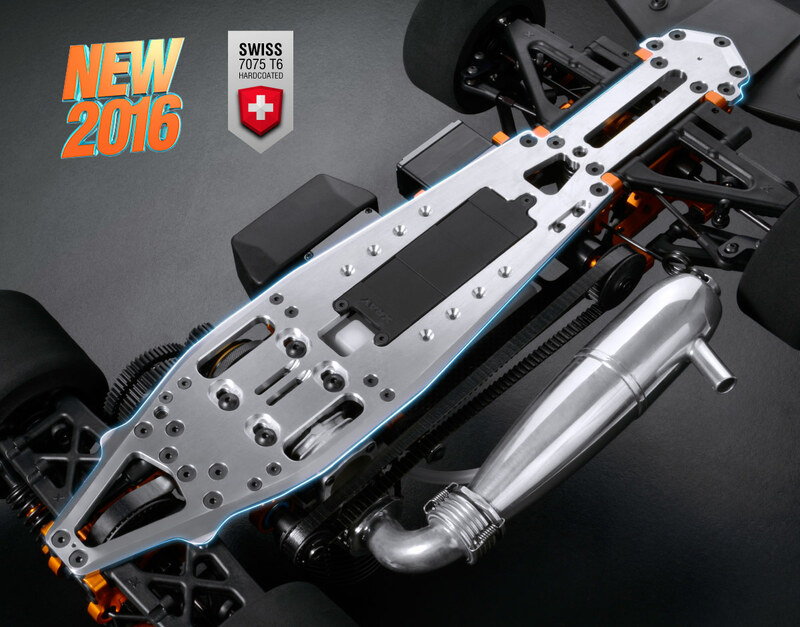 CNC machined from premium Swiss 7075 T6 aluminum, the smart design also allows for quick & easy front belt changes. The new radio plate was re-designed to work with the new aluminum bulkheads, new fuel tank, and new steering servo mounting system. The radio plate is CNC-machined from 2.5mm graphite material and the design allows for easy removal of the entire radio plate (with all electronics) for quick & easy servicing and cleaning. 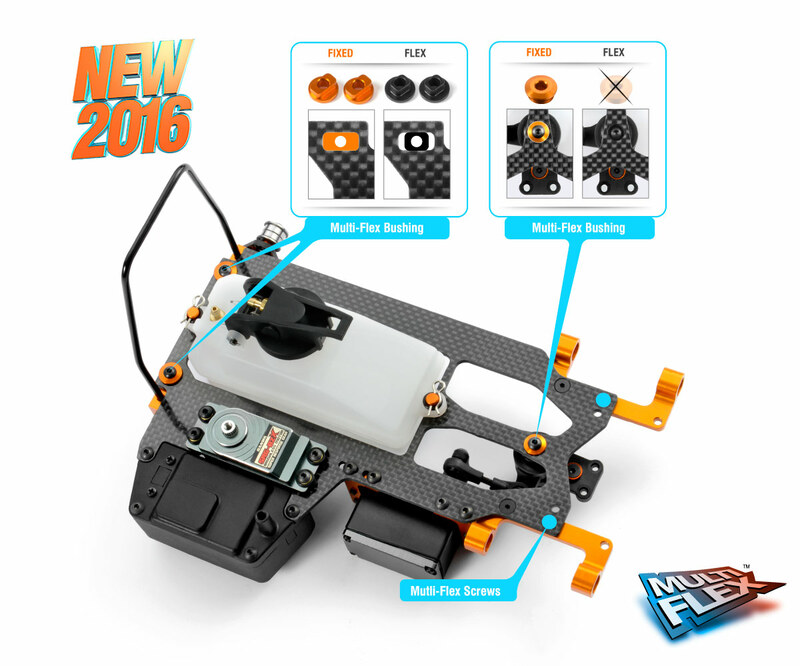 A brand new and very useful new feature is the front Multi-Flex™ adjustment via radio plate bushing in the servo saver area. When the bushing is used, the setting has a fixed position; when the bushing is removed, the screw is directly mounted on the servo saver post and the whole front suspension has increased flex. The fixed setting is recommended when there is sufficient in-corner steering, while the flex setting is recommended for increased in-corner steering. All-new radio plate mounts were re-designed to fit into the new aluminum frame. 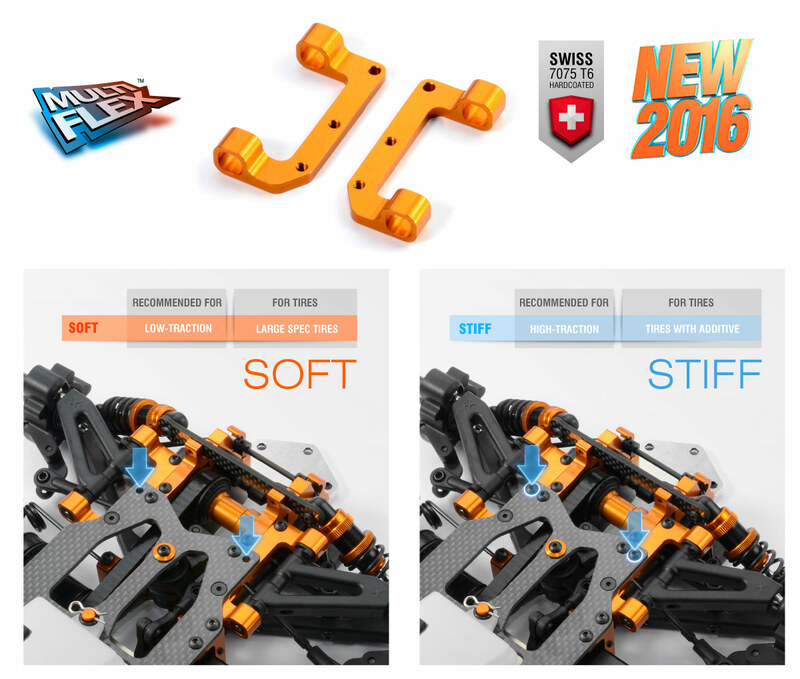 Made from Swiss 7075 T6 aluminum, these lightweight mounts give improved flex characteristics and durability. The muffler mounting system was re-designed and moved from the alu front middle shaft holderto the front left bulkhead to allow alu front middle shaft holder to adjust the belt tension of the front and side belts. 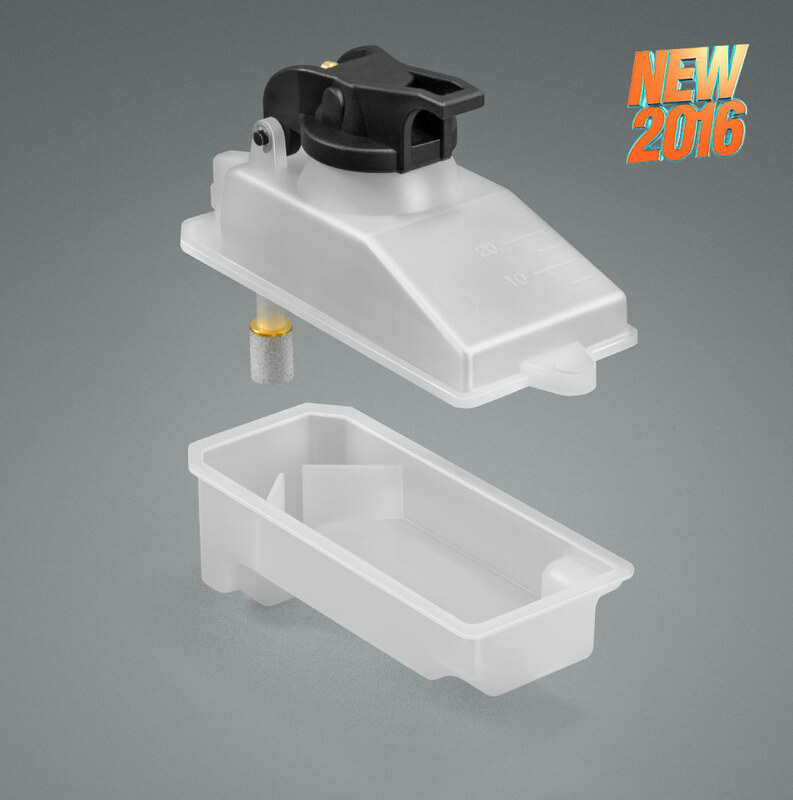 All new narrower fuel tank allows for improved fuel movement for more stable & consistent engine operation mainly at lower fuel levels. The 125cc fuel tank with hypertonic tank lid and internal stone-type filter is positioned in the center of the car and sits as low as possible. The internal baffles inside the fuel tank ensure that the fuel will always be in the area around the fuel line intake so even in long, fast corners the fuel will be constantly supplied to the engine. The new fuel tank mounting has been re-designed with the fuel tank being mounted atop the radio plate for easier insertion & removal from the car. Cleaning and maintenance around the fuel tank and radio plate is now much easier. The fuel tank is mounted on aluminum fuel tank posts with rubber grommets and secured by micro clips. The receiver battery pack is located beneath the fuel tank help create the lowest CG possible. New engine mounts were re-designed to be mounted to the chassis the same distance from the center of the chassis and closer together for equal & improved flex characteristics. The quick-set engine mounts are CNC-machined from premium high-strength aircraft aluminum. The engine mount has a fixed position for super-easy engine installation and gear mesh adjustment. 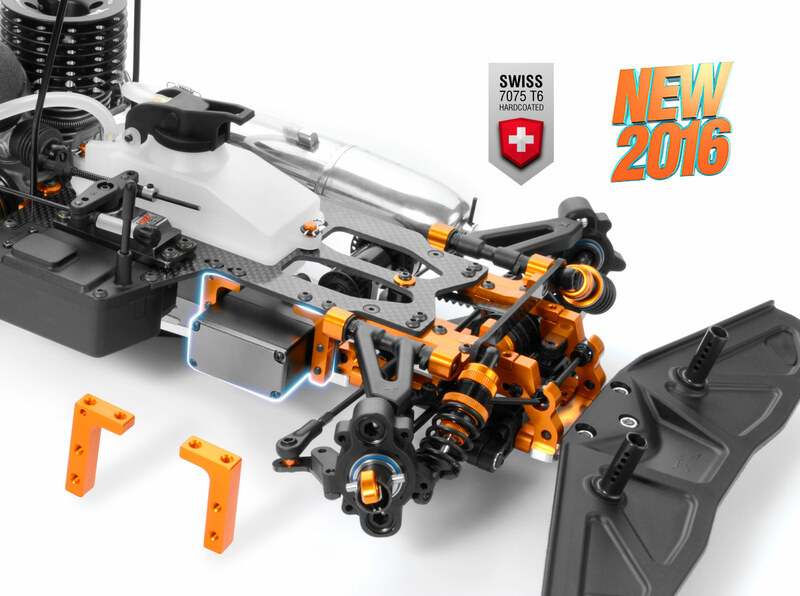 All-new front & rear suspension holders are CNC-machined from premium Swiss 7075 T6 and are fully independent from the bulkheads, mounted directly to the chassis to increase traction and make the car easier to drive. Suspension mounts were designed and placed on the chassis for better geometry and maximum traction & steering. 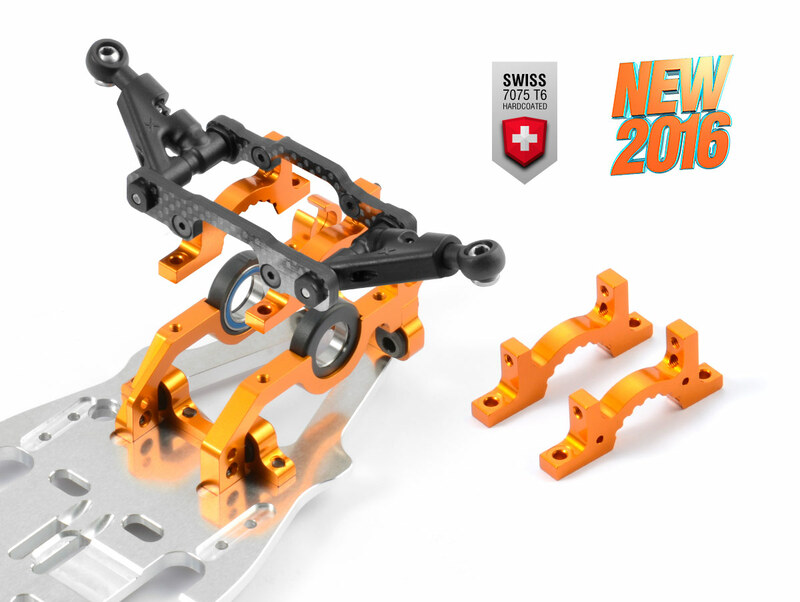 All suspension mounts are CNC-machined from premium Swiss 7075 T6 aluminum to provide the lightest & strongest support framework for the car. 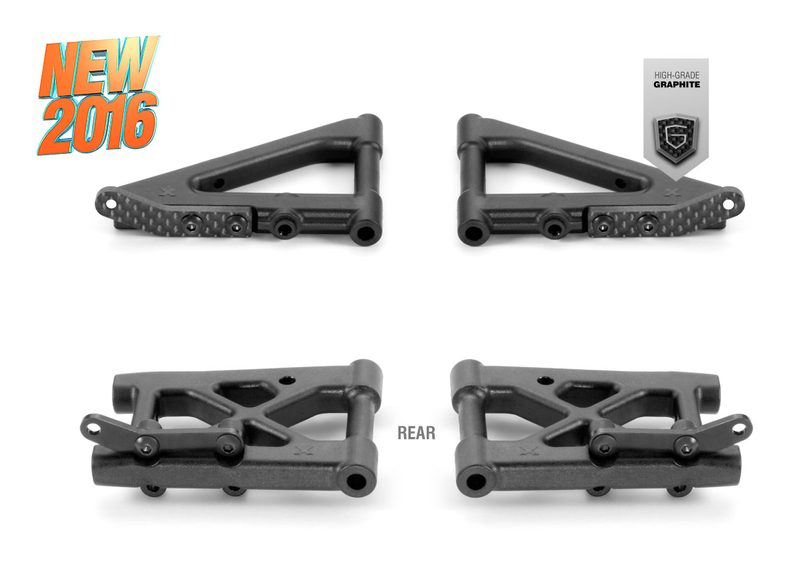 All-new rear upper arm holders are machined from very strong 3.5mm graphite material for optimized flex characteristics of the rear suspension. Both rear and front mounts are mounted on the rear upper clamps. The positions of eccentric bushings were designed to achieve new geometry for maximum traction & steering. 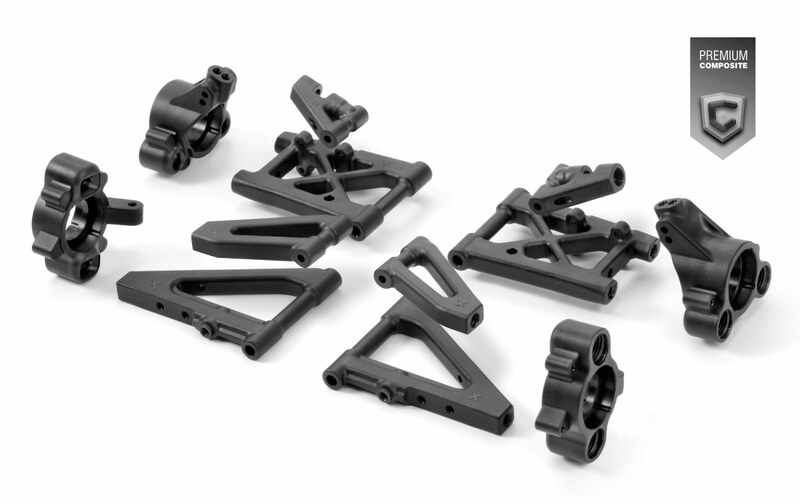 Compact front & rear shock towers are CNC-machined from premium-grade 2.5mm graphite (front) and 3.0mm graphite (rear), and have been re-designed with new shock-mounting positions. Pivot pins for rear upper & lower and front lower suspension arms have been modified to fit new aluminum suspension mounts and new geometry. 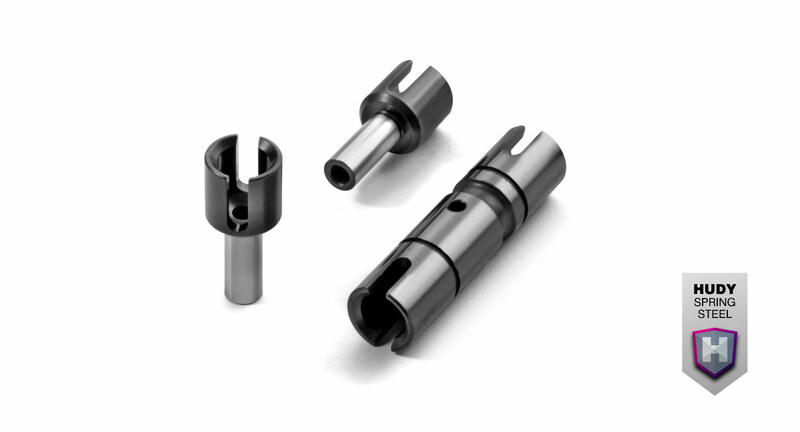 Rear upper pivot pins with a machined groove that allows better fixing by setscrew, helping to prevent pins from coming out during operation. The front arms were extended to work with the new front suspension geometry, and the position of the front wire anti-roll bar was re-designed as well. 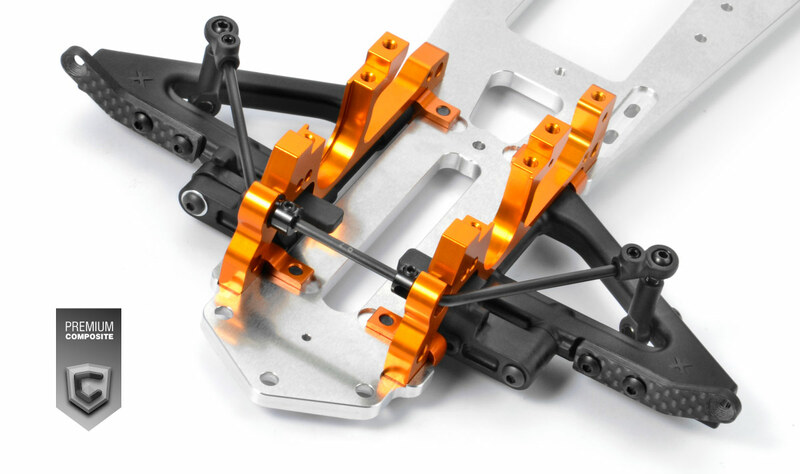 Suspension arms are one of the most important parts of any RC model car, as they directly influence the handling and racing characteristics of the car. 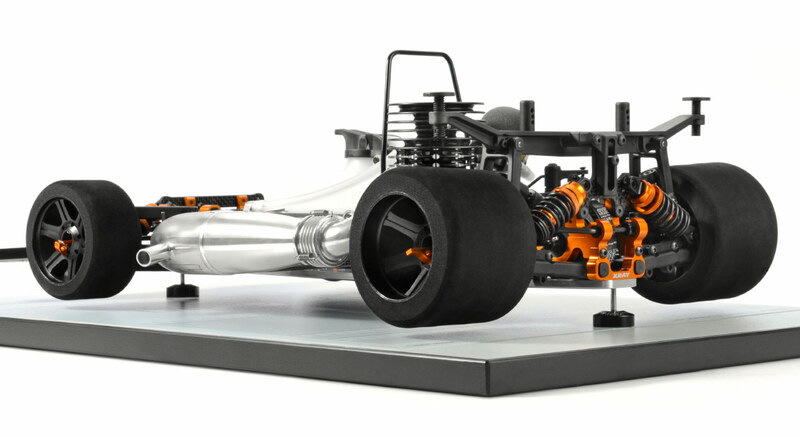 The RX8 suspension arms are the result of long-term testing of different designs and layouts. Length, thickness, flexibility, geometry of suspension points and materials used… these are all the concepts and details that had to be thoroughly reviewed to create optimal suspension arms. 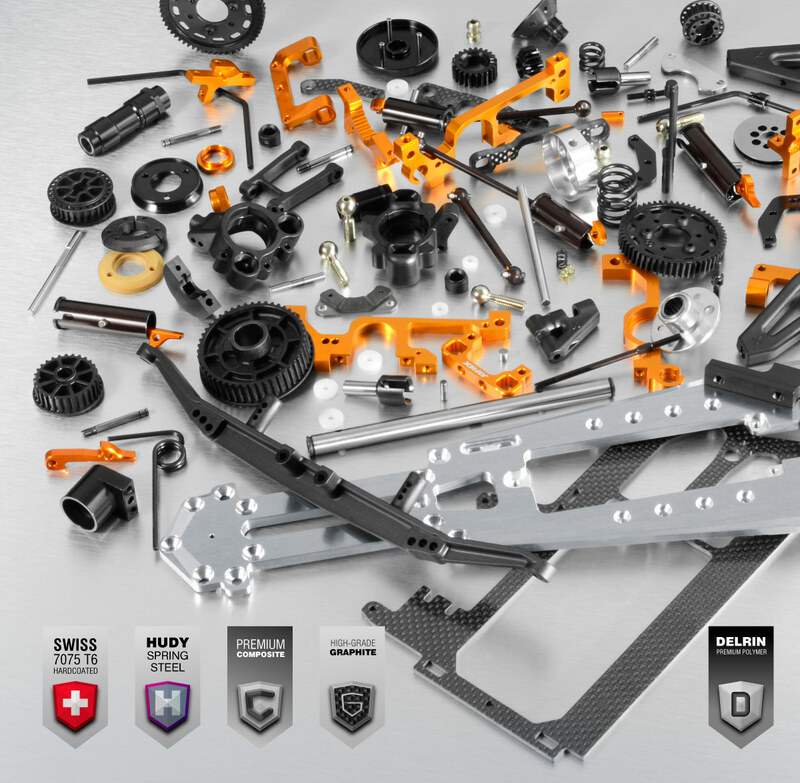 The exclusive composite mixture used for suspension arms is a perfect balance between reliability and performance. The suspension arm itself is rigid enough to provide a responsive feel, yet soft enough to provide extreme durability. 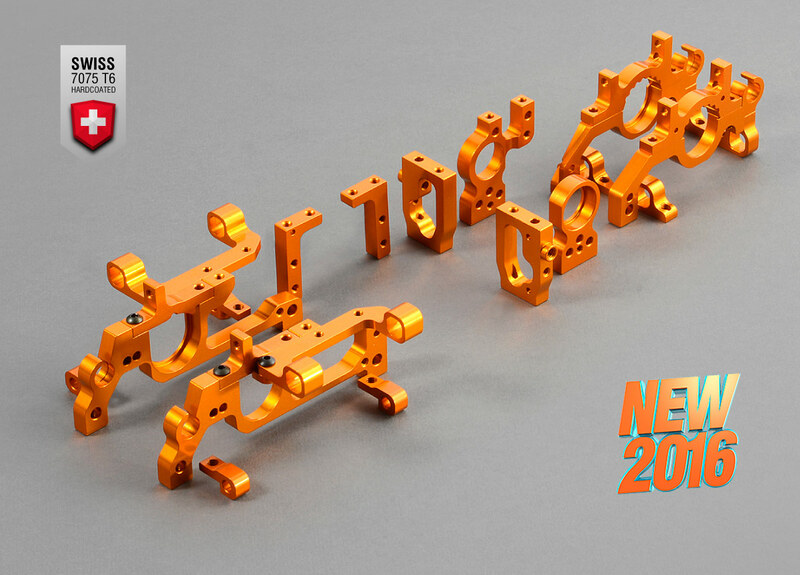 The steering block extensions were re-designed for new Ackermann geometry and improved steering characteristics. The extension is mounted to the steering block, and features 3 different Ackermann positions. The kit includes 2mm bump steer shims for improved bump steer characteristics; bump steer can be easily changed by adding or removing shims. The new extensions for steering blocks are made from Swiss 7075 T6 aluminum for increased durability and unmatched lifespan. 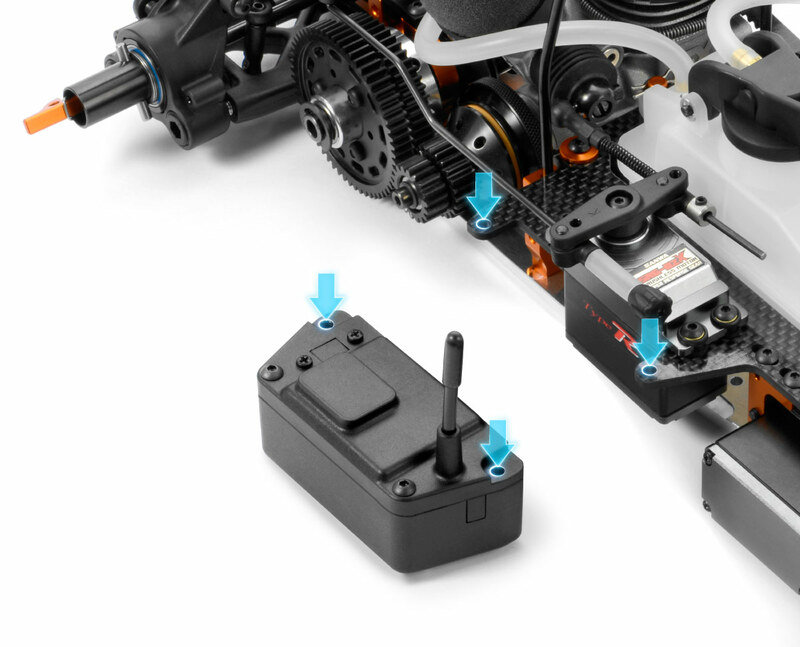 All-new radio steering servo mounts were re-designed to fit into the new radio plate. The steering servo mounts are CNC-machined from premium Swiss 7075 T6 aluminum to provide the lightest & strongest support framework for the car. New main servo saver shaft and servo saver pivot shaft were redesigned to work with the new improved higher roll center position of the radio plate. The centralized servo saver is ball-raced to ensure super-precise, smooth operation, and the adjustable spring preload tension allows for fine tuning. The servo saver also features easily-adjustable Ackermann positions which greatly influence the steering characteristics, allowing the RX8 to be adjusted for driving styles and track conditions. 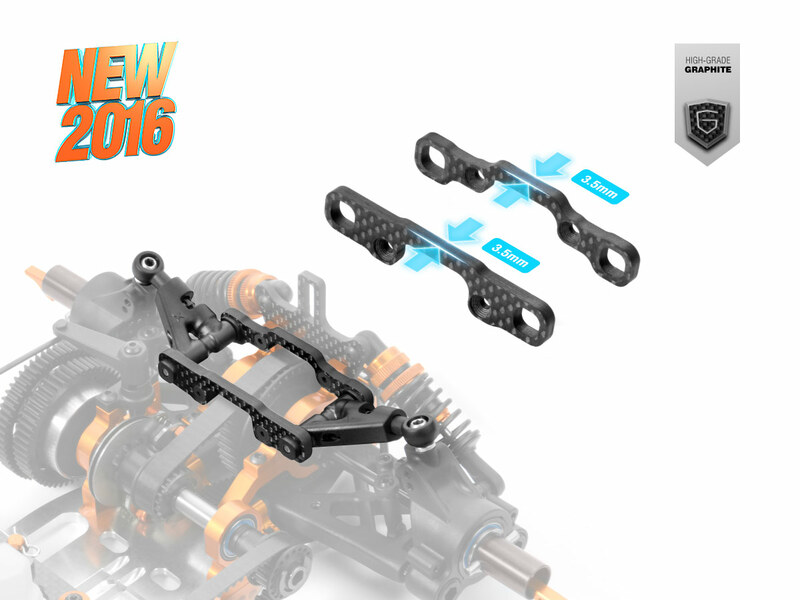 Both front & rear suspension extensions feature new optimized shock mounting position for the RX8’s new geometry. The front extensions are machined from graphite, while the rear extensions are laser cut for improved durability and additionally black coated. 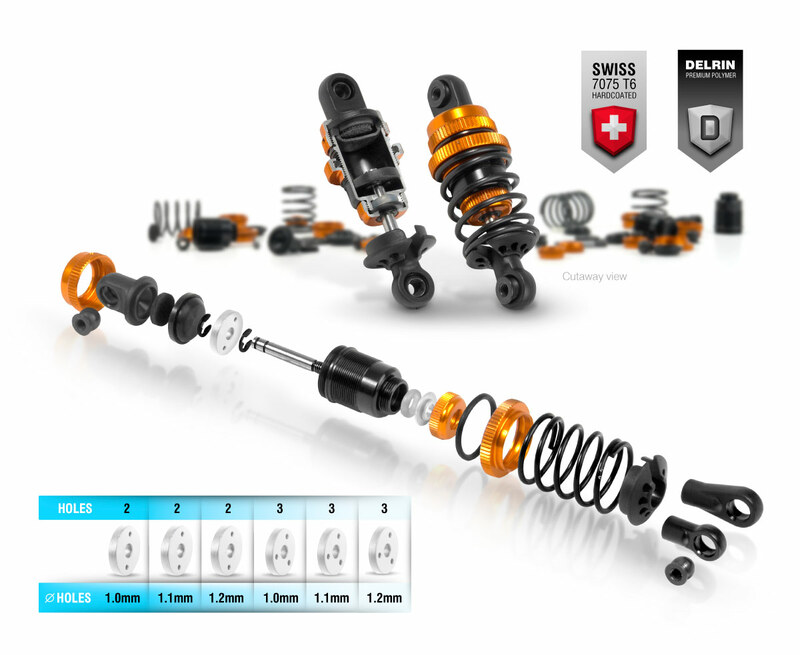 The shock absorbers have new longer shock ball joints to work with the new shock geometry, as have optimized up- and down-travel. The set of pistons include 2 and 3-hole pistons with 1.0, 1.1, and 1.2mm diameter holes. The pistons are precision molded from special Delrin™ material to ensure perfect roundness for extra-smooth dampening, while maintaining maximum stiffness and durability. 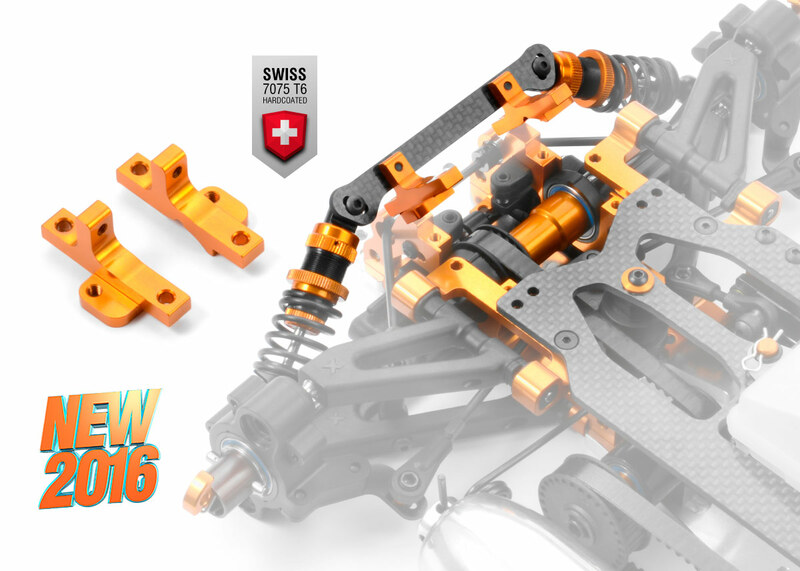 Shock bodies are CNC-machined from premium Swiss 7075 T6 aluminum and hardened to ensure maximum lifespan. External fine threading allows for quick & easy ride height adjustment. The shocks feature low-profile membranes for super-smooth, precise damping. 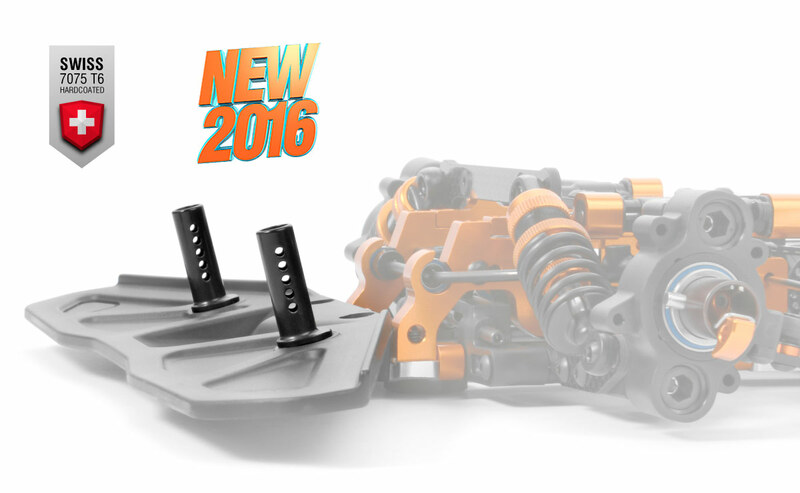 The all-new rear solid axle & pulley have a new design to work with the new aluminum bulkheads. The front one-way and rear solid axle are small and light, ensuring super-low rotating mass and lowest CG. The super-lightweight front one-way bearing is inserted directly in the axle, and the axle body is machined from Swiss 7075 T6 aluminum. The rear composite lightweight axle pulley is mounted on a 1-piece solid HUDY Spring Steel™ axle. All outdrives are manufactured from HUDY Spring Steel™ and are specially ground for maximum precision. All pulleys have self-cleaning holes. The new RX8 includes both wire & blade-style front anti-roll bars for freedom of choice based on track conditions. The front wire anti-roll bars are all new. 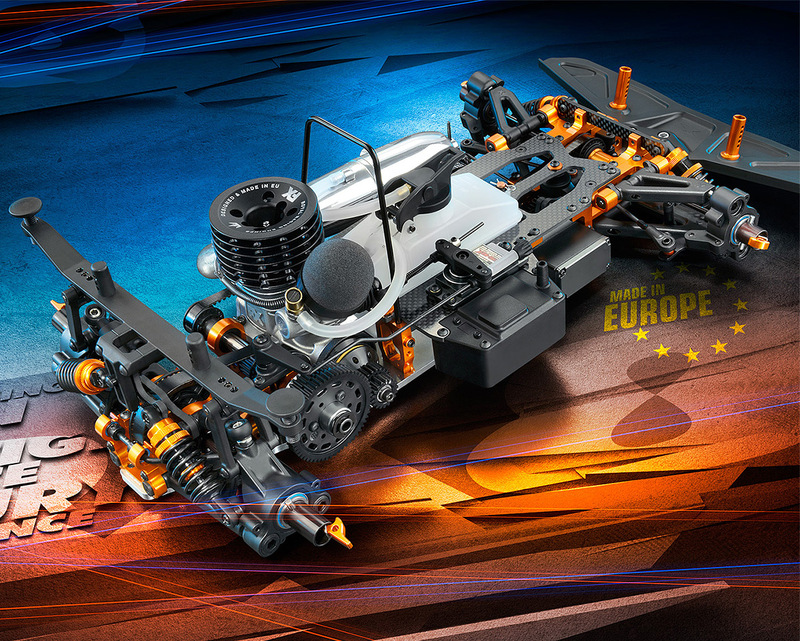 The shape of the wire was re-designed to work with the new front suspension geometry and give improved action. 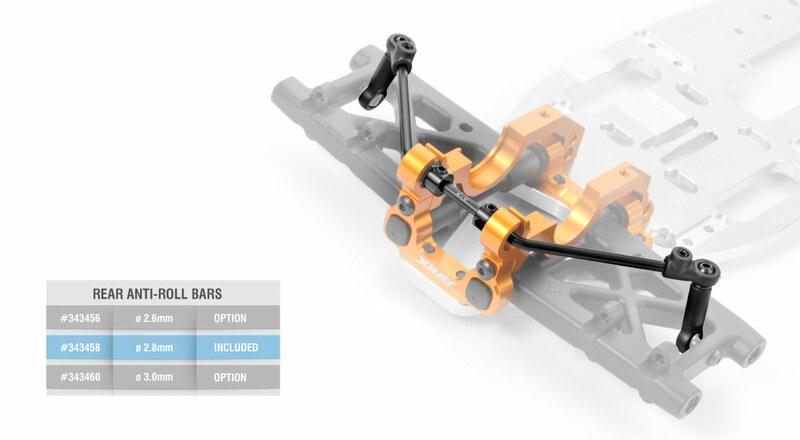 The wire anti-roll bar is used to increase steering response on small, technical tracks. The wire anti-roll bar is mounted to the bulkheads from the outside, for quick & easy changes and adjustment. The roll bar turns in ball-bearings for maximum precision and freedom of movement. Anti-roll bar height can be quickly & easily adjusted. The blade anti-roll bar is used for improved cornering speed on larger, open tracks. 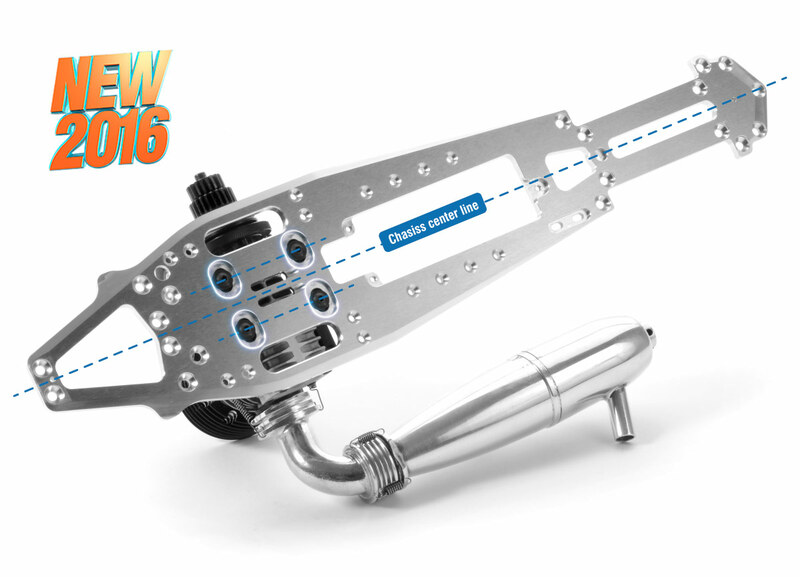 The front blade-style anti-roll bar is fully-adjustable, and is fully independent from the downstop adjustment. The hand-ground front anti-roll bar blades — manufactured from HUDY Spring Steel™ for longest lifespan — are easily adjusted using a 1.5mm hex wrench. The front body posts are machined from premium Swiss 7075 T6 aluminum and are additionally lightened for minimal weight. 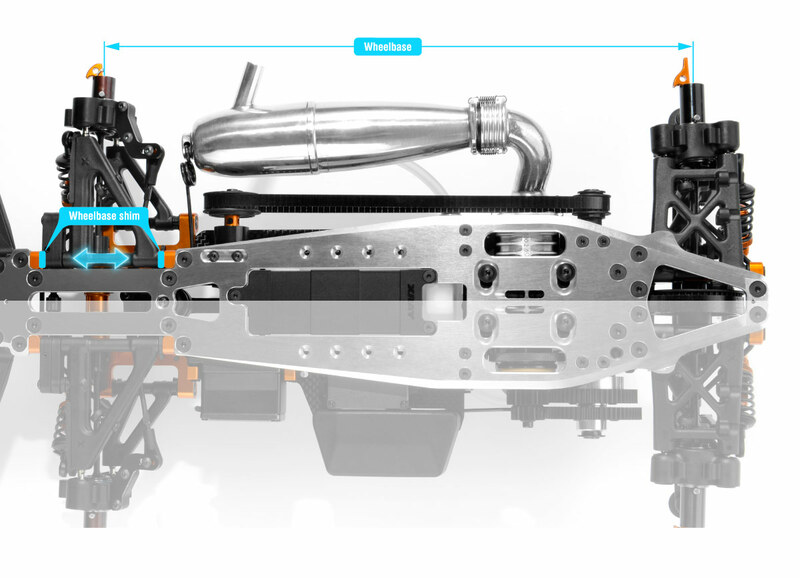 The special composite rear body mount features 3 positions for rear upright downforce adjustment. 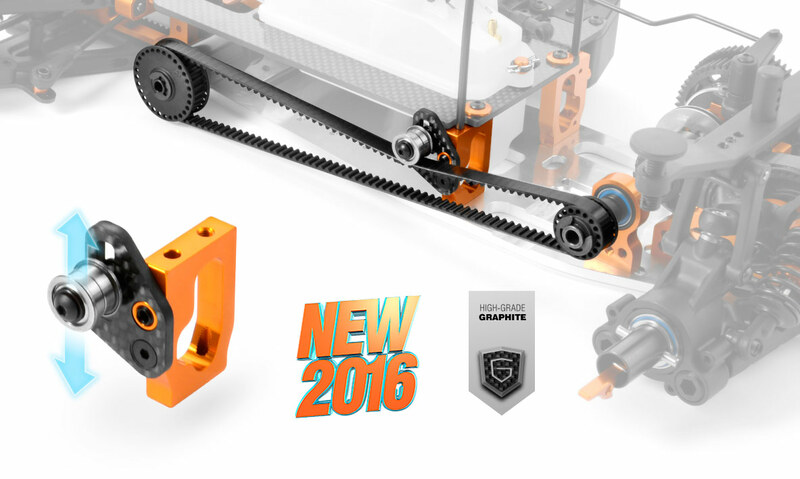 The graphite belt-tensioner plate was re-designed to fit the new aluminum frame of the car. 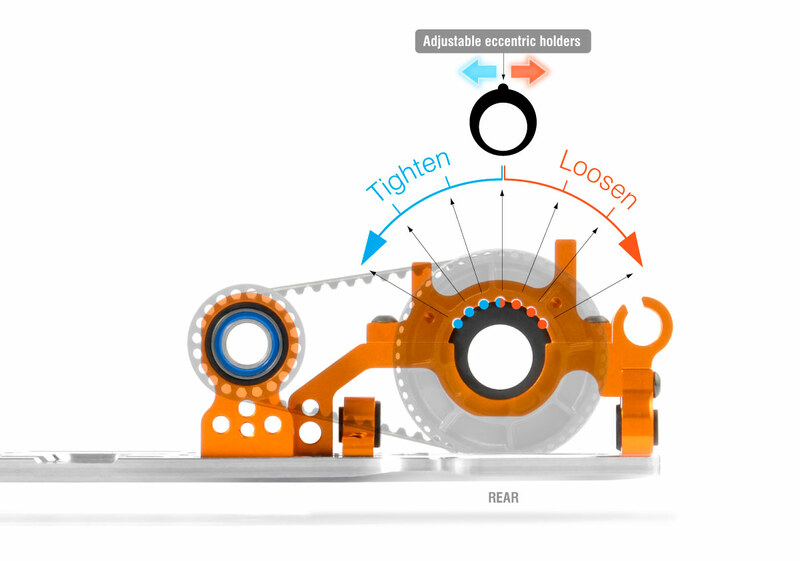 This smart design allows the side-belt tensioner to be easily adjusted, or easily removed for engine removal. The RX8 includes all-new pinion gears specially designed for 1/8 on-road cars; they replace the previously used NT1 pinion gears. 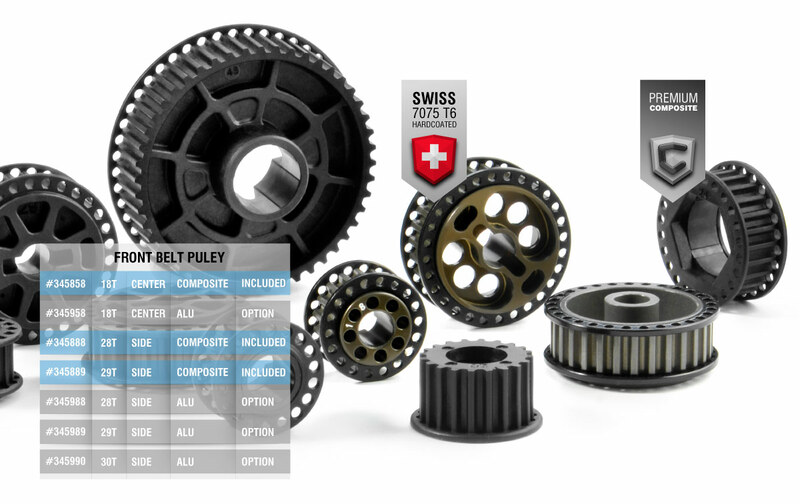 The difference in the design of the pinions is with the extra material added to the pinions to make them stronger and more durable, while keeping the same pitch. The pinions are machined from tough 7075 T6 aluminum and specially hardcoated for superior strength, light weight, and high durability. Created on a special gear machine, all pinions feature ultra-precise tooth shaping and ultra-true running for vibration-free operation. Fine internal threading allows easy installation on XCA clutch bells (standard or lightweight versions), and each pinion is fine etched with the tooth number for quick & easy identification. The RX8 is luxury model racing car and as such features only the most premium materials: premium woven graphite - exclusive top-secret HUDY Spring Steel™ - high grade Swiss 7075 T6 - high-tensile heat-treated steel and aircraft aluminum - and XRAY's self-developed and formulated composite compounds. All is premium and unique on the RX8. The RX8 features a smooth & efficient on-road drivetrain with intelligent design & construction of all drivetrain parts for super-smooth and low-friction operation. 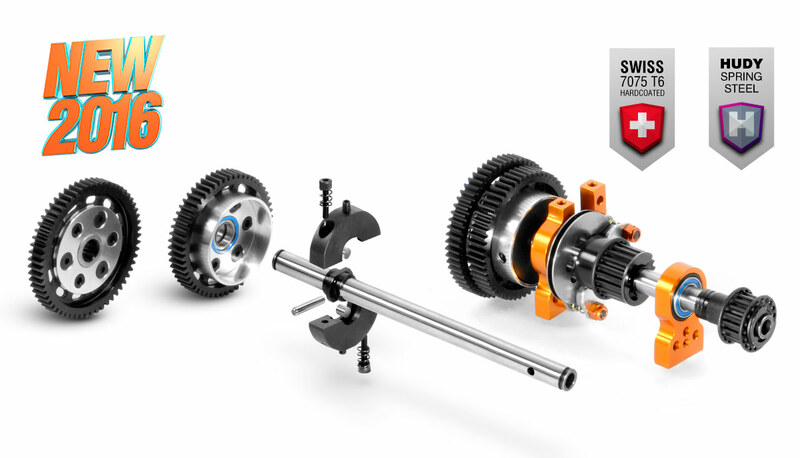 From the small lightweight axles, through the efficient ratios and lightweight pulleys, to the high-speed lightly-oiled bearings and lightweight drivetrain parts, all parts are specifically designed for maximum efficiency & durability. The 2-speed transmission features a small & light carrier for the 2-speed gear, small & light alu drive flange with the one-way bearing, and smaller & lighter gears from the well-proven NT1. All this combines to give better bottom-end power and acceleration. The 2-speed transmission parts are installed on a precision-manufactured, super-smooth lightweight hollow middle layshaft made from tough HUDY shaft steel for 2-speed, which is additionally heat treated for extra strength and long life. The 2-speed gear adapter is CNC-machined from Swiss 7075 T6 for precision fitment of the 1-way bearing, and allowing super-precise and wobble-free installation of spur gears. The high-quality 1-way bearing is hand-ground before installation for maximum running precision and strength. The 2-speed adapter is manufactured from hardened steel. The XCA (XRAY Centrifugal-Axial) clutch has been re-designed for use with the new smaller rear transmission. Small & light gears are used, and a new 4-bearing system for the clutchbell gives improved durability. This clutch design provides smooth & fast acceleration, while increasing the lifespan of the clutch shoe. The easily-adjustable 3-shoe clutch features clutchbell, clutch nut, flywheel nut and thrustbearing collar made from exclusive HUDY Spring Steel™. 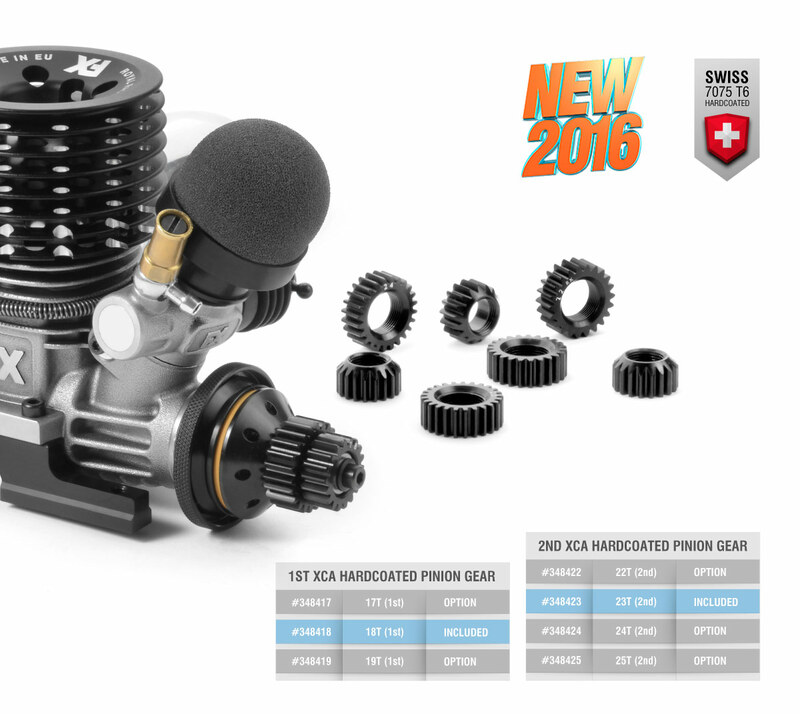 The hardcoated flywheel, clutch disc, and spring cup are made from premium Swiss 7075 T6 aluminum. The small 2-speed allows the use of smaller spur gears from the well-proven NT1, allowing fast acceleration and low rotating mass. 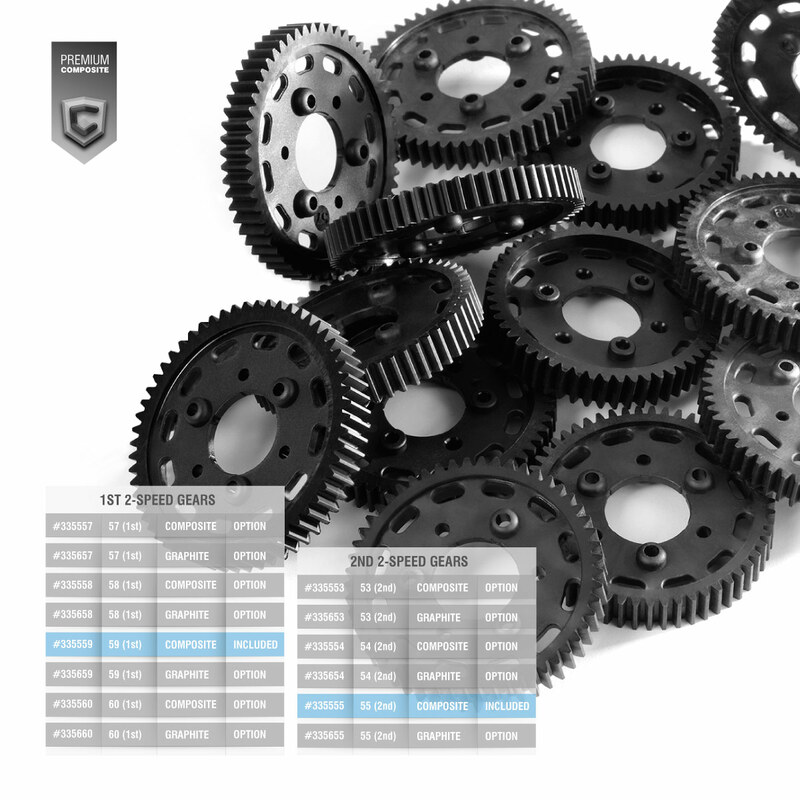 Precision-molded spur gears are made from XRAY's exclusive secret blend of composite material, allowing the gears to run true & quiet, while being robust enough to handle the power of a modern nitro engine. 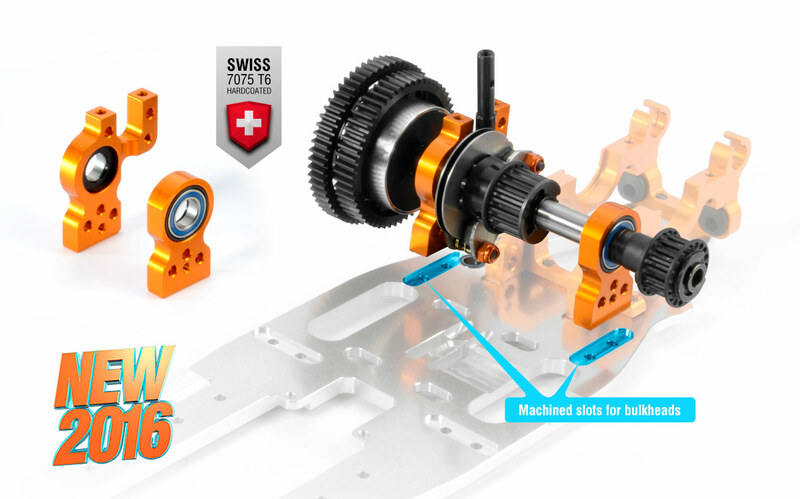 The spur gears are molded with a special technique allowing the gears to be absolutely true, thus improving the drivetrain efficiency. Each gear is stamped with a tooth number for easy identification. A strong, highly-efficient brake system was created by focusing on all of the smallest details. The laser-cut, precision flat-ground ventilated steel brake disk features extra-deep machined grooves making it very light and the split design allows maximum heat absorption. The ventilating holes are by design outside of the brake pad area to ensure maximum contact of the pads with the disk. Precision hand-grinding on flat grinding machine allows true, wobble-free rotation. The specially-glued pads are resistant to high heat, and the special high-grip brake pads give strong, fade-free braking. Both the brake disk and brake pads are specially heat-treated for maximum lifespan. 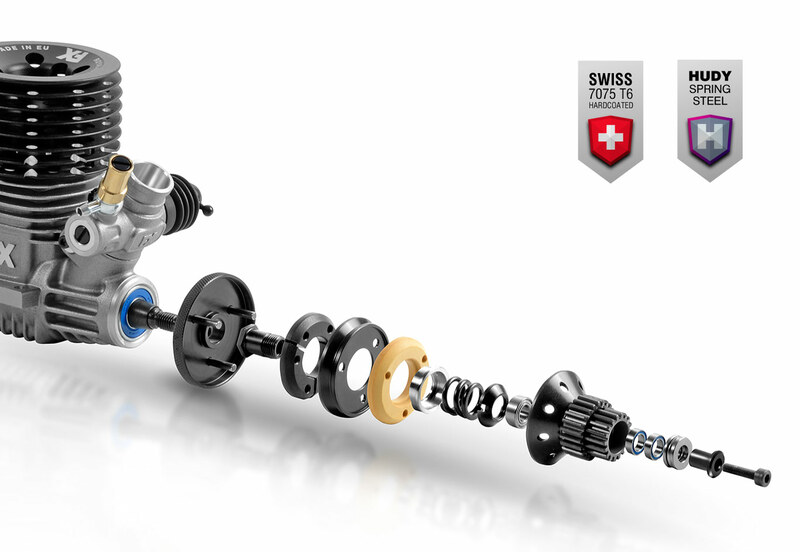 Brake inputs are transferred precisely to the brakes thanks to the ball-raced super-smooth brake cam. The alu brake cam is machined from hardcoated, black anodized 7075 T6 aluminum for better durability. Two spacing springs ensure a proper gap is maintained between the brake pads to reduce parasitic drag and heat build-up. The tiny drive shafts are manufactured from HUDY Spring Steel™, the most effective drive shaft material by the industry leader HUDY. 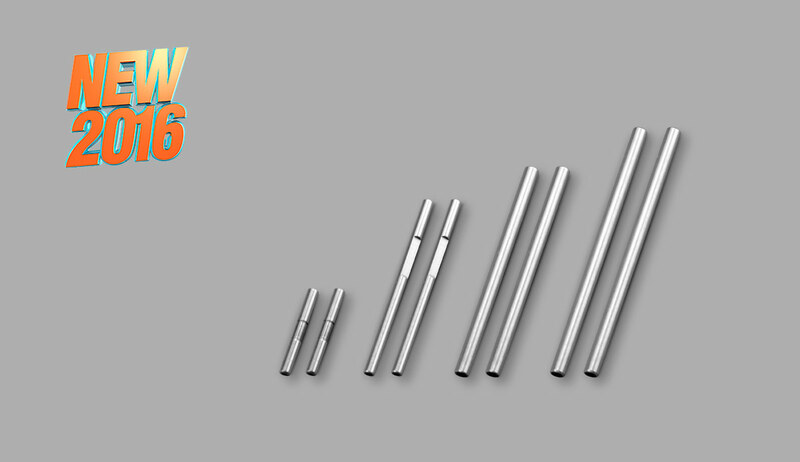 Self-developed HUDY Spring Steel™ ensures the longest drive shaft life, maximum strength, and lowest weight. The front of RX8 is driven by CVD driveshafts, while standard dogbones are used in the rear. Hardened with a proprietary process, the drive shafts provide unbeatable lifetime and reliability. 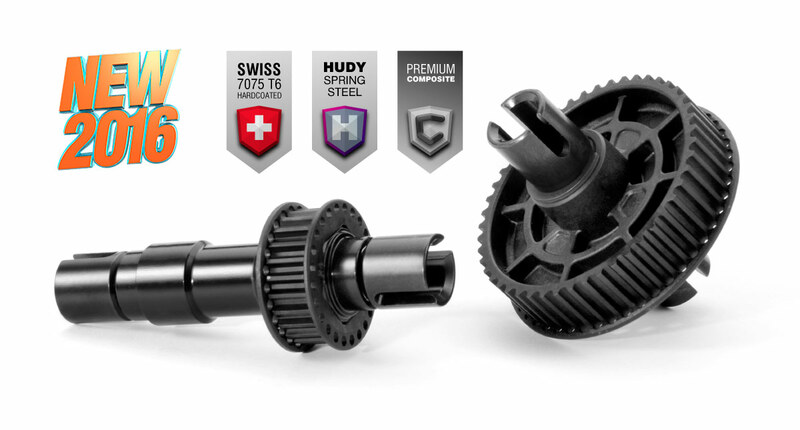 All axle outdrives and wheel axles are manufactured from premium HUDY Spring Steel™ which has been additionally hand-ground for maximum precision and easy fit. These parts have unmatched lifespan and maximum strength to withstand the tremendous forces generated by today’s modern nitro engines. To guarantee maximum reliability all turnbuckles are manufactured from special HUDY Spring Steel™ material for turnbuckles for maximum core strength. All pulleys are molded from a special composite mixture to ensure low-friction operation, efficient and strong tooth profiles, and long lifespan. Pulley covers feature self-cleaning holes. 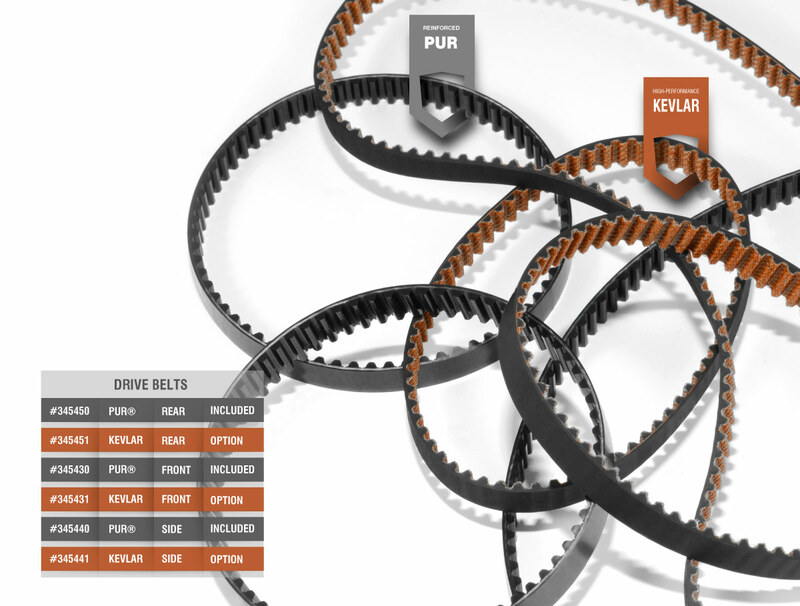 The drivetrain is operated by PUR®-reinforced high-efficiency low-friction drive belts, which ensure that all power is properly and efficiently transferred to all drivetrain parts. Rear upper clamps feature integrated belt-tension adjustment using adjustable bearing eccentric holders, eliminating the need for a separate belt tensioner. All ball-bearings turn in composite hubs to reduce friction and improve drivetrain efficiency. The RX8 features the most advanced, race-engineered suspension geometry for nitro on-road car racing and is designed to provide responsive racing characteristics under all racing conditions. 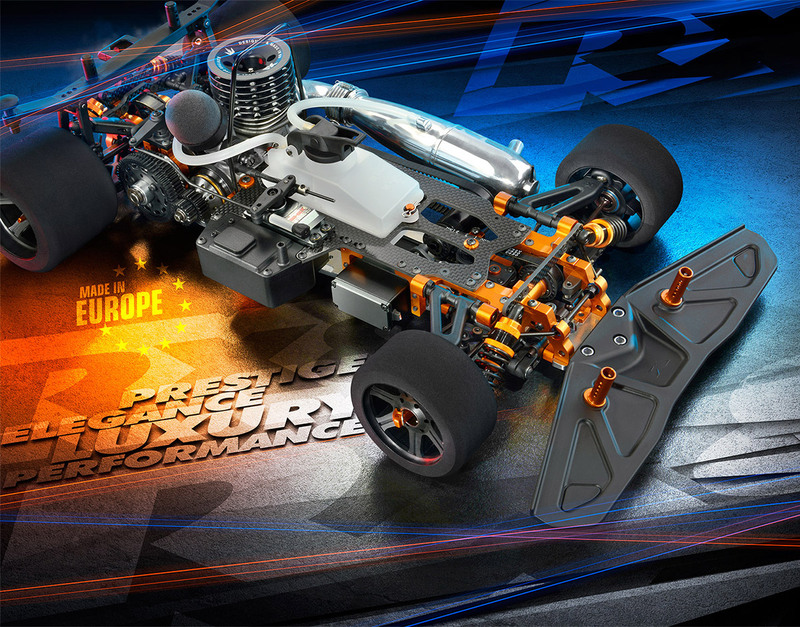 Over the years XRAY has successfully gained and utilized extensive suspension geometry knowledge and self-developed suspension stiffness technology, which have been used with great success in electric & nitro cars, both on- and off-road. The ultra-lightweight suspension parts are molded from special composite materials that make the parts very light yet very durable to withstand the rigors of high-performance racing. The design of the RX8 features I.S.S. (Integrated Suspension Settings™). All adjustment possibilities are completely integrated, allowing complete set-up changes without changing or replacing any parts. The use of square eccentric bushings in the front bulkheads, as well as in the rear bulkheads for upper & lower suspension, allows for complete geometry adjustment. Roll centers are adjustable in the standard upper & lower positions, as well as in inner and outer positions. 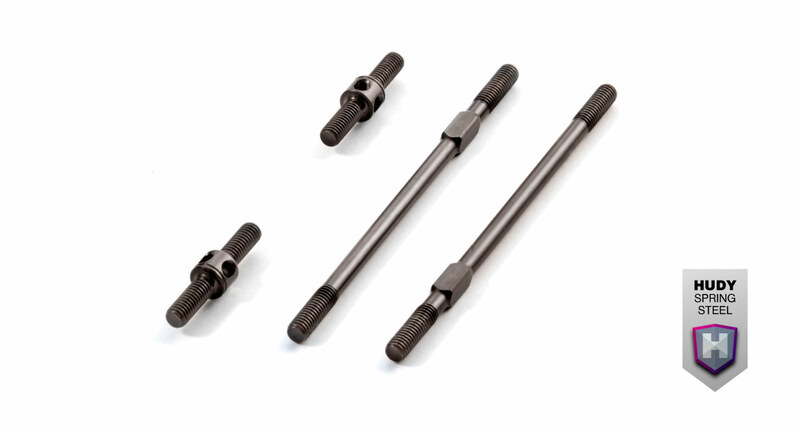 High-tensile steel suspension pivot pins are polished for smooth suspension action. 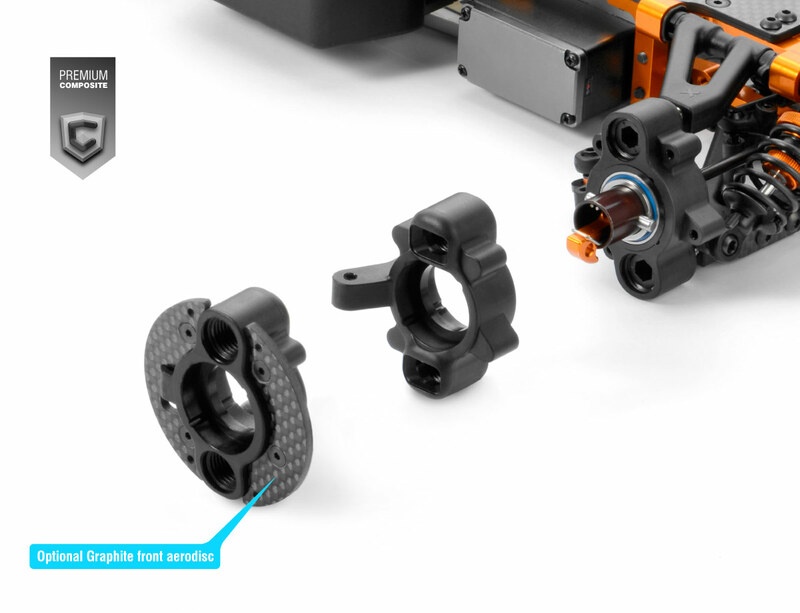 Front steering block and rear uprights feature concentric and eccentric bushings which allow roll center adjustment as well as positive caster adjustment in front. The eccentric bushings in the rear upright also allow independent wheelbase adjustment. The height of front and rear axles can be easily adjusted with eccentric bushings. Wheelbase & Weight Balance Adjustment. 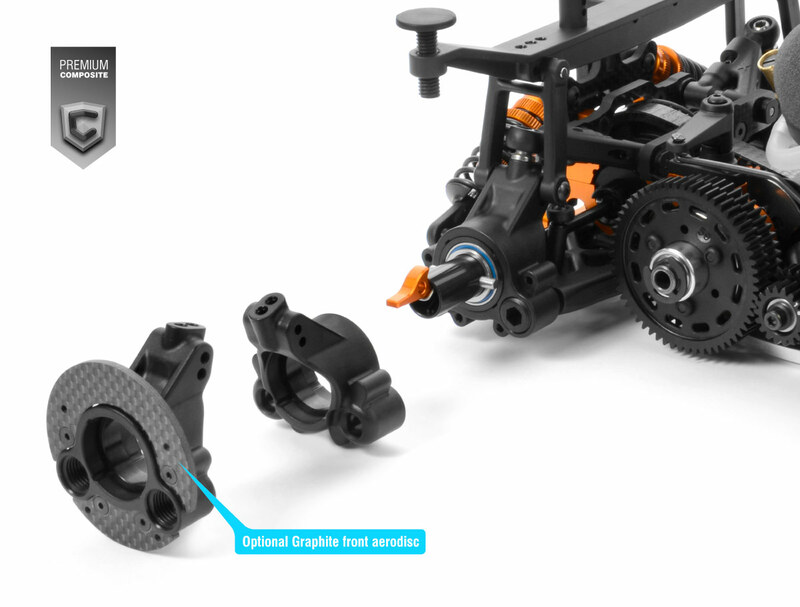 Wheelbase can be easily adjusted using clips on the front suspension. Moving the arms towards the front or rear can also be used to fine-tune weight balance. Wheel offset is easily adjustable by 0.5–2.5mm using included shims. This affects steering adjustment (when adjusted at the front) and also rear traction characteristics (when adjusted at the rear). 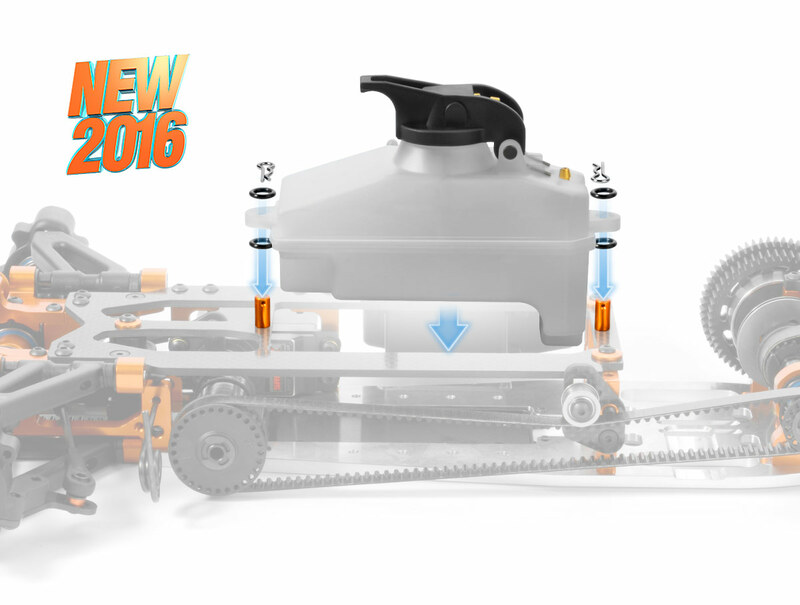 FRONT Less offset at the front gives more in-corner steering and improved steering response. Recommended for small technical tracks. More offset at the front gives more stability and makes the car easier to drive on large tracks or under high-grip conditions. REAR Less offset at the rear gives more in-corner steering, but less rear traction and stability. Therefore it is recommended to use less offset on small technical tracks or under high-traction conditions. More offset at the rear makes the car more stable and improves cornering speed. The tiny, tough steering blocks are molded from a special composite mixture for maximum strength. Thanks to perfect molding, bearings fit into the steering blocks without any extra play for maximum stability and steering. The included 0° kingpin steering blocks allow the mounting of optional graphite aerodynamic disks which improve both low & high-speed steering, , and improve stability in high-speed corners. The small, compact rear uprights are very strong due to the special composite mixture used. Thanks to perfect molding, bearings fit into the rear uprights without any extra play, giving maximum stability and handling. The rear uprights allow mounting of optional graphite aerodynamic disks which improve, improve rear traction, and improve stability in high-speed corners. The rear uprights feature two easily-adjustable upper roll center positions which are used for traction adjustment. The uprights also feature two body mount adjustment positions depending on the type of body used. Also included are shorter and longer pivot ball joints for optimum set-up adjustment. The RX8 pivot ball suspension contains precision pivot balls which are specially hardened for enhanced lifespan and to withstand hard crashes. 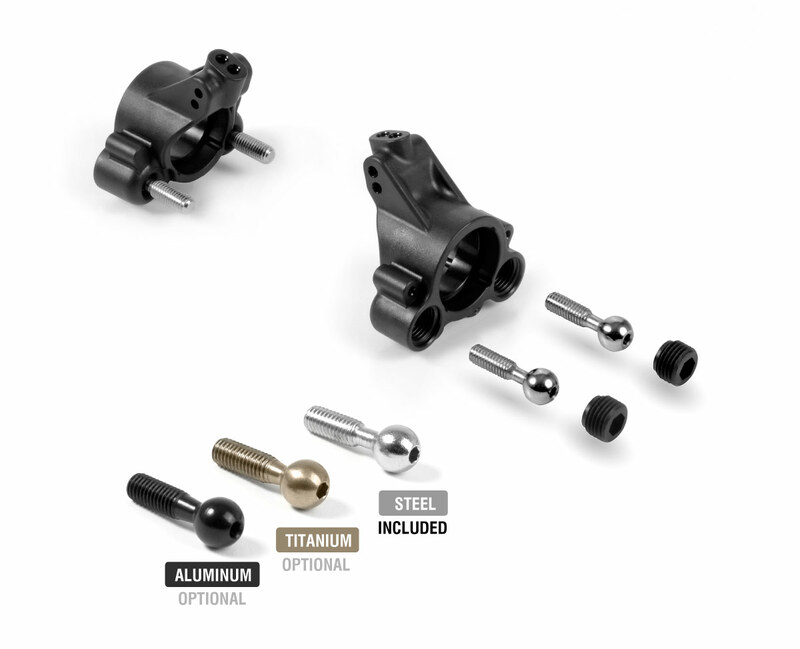 A total of eight (8) pivot balls are included and are captured by strong M10 composite nuts to minimize weight and give smooth suspension movement. Standard pivot balls are made from steel for maximum durability and lifespan. For those who are focused on minimizing unsprung weight, optional lightweight aluminum and titanium pivot balls are available. The RX8 comes equipped with C7.5 front springs to provide maximum stability and steering, and C5.6 rear springs to provide maximum traction & cornering speed. 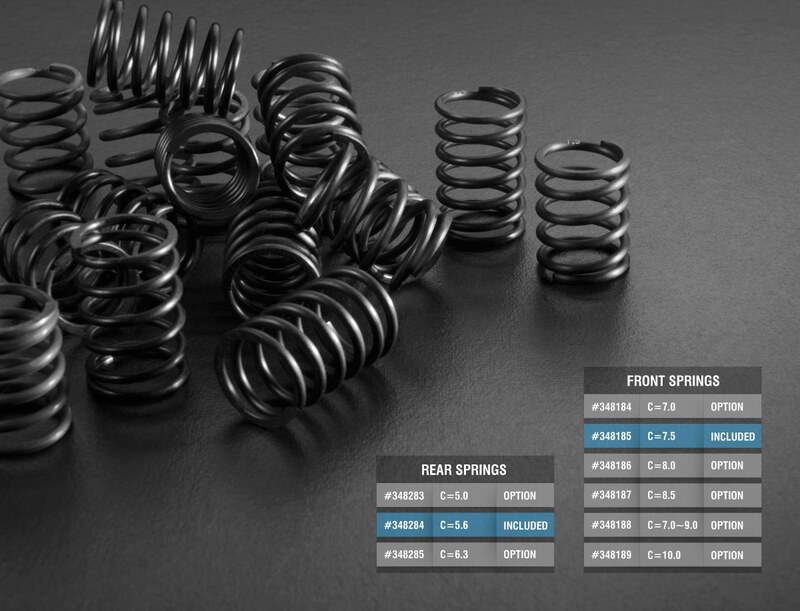 The RX8 springs, like all the other XRAY springs, are manually measured, selected and matched into pairs to guarantee precisely equal length and damping characteristics. The rear 2.8mm anti-roll bar helps to reduce rear chassis roll. The roll bar turns in ball-bearings for maximum precision and freedom of movement. For fine precision tuning, optional wires of different thickness are available. 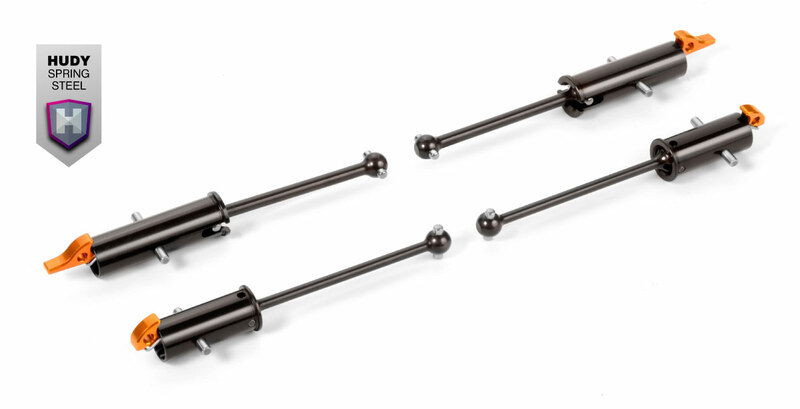 Anti-roll bar height is adjustable via a screw… quick & easy. XRAY Premium Silicone Oils are manufactured in Europe by a specialized premium silicone oil manufacturer; these new oils were exclusively created for XRAY. Each batch of premium oil is laboratory tested and calibrated to ensure the highest possible consistency and quality batch-to-batch. Based on the industry-standard cSt rating, the new line of oils will be easy to identify, adjust, and feel. When following any setup sheets by XRAY or XRAY team drivers, you can be sure that the oils you will get for your car will be exactly same as used by the factory racing team, thus ensuring very exacting setups and handling. The RX8 is fully ball-bearing equipped and features high-speed, blue-sealed ball-bearings throughout the drivetrain for maximum drivetrain efficiency. 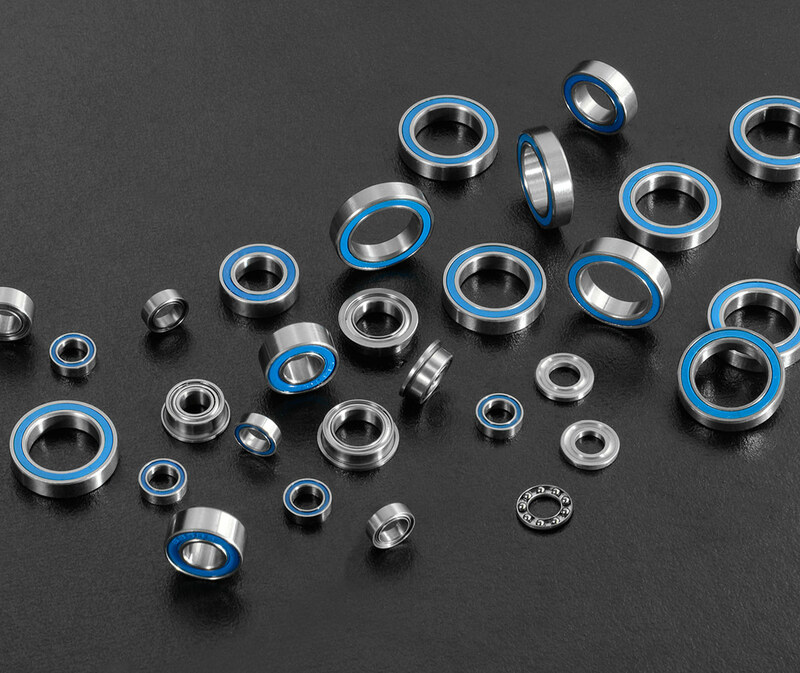 The high-tolerance, high-performance bearings are degreased and lightly oiled with Aero Shell Fluid 12™ for maximum smoothness and long life. The main ball-bearings are oversized with extra-strong bearing frames to ensure smooth, efficient running even under extreme conditions. 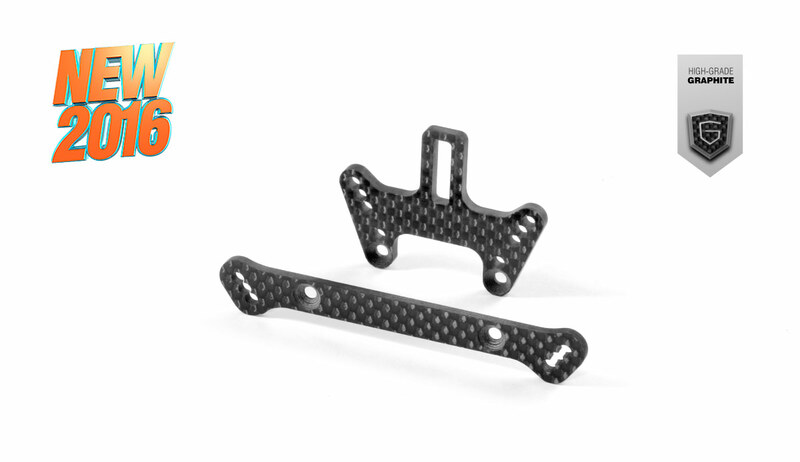 The rear body mount holder allows the mounting of all popular racing bodies and meets all EFRA rules. The reinforced body mount is reliable and durable to withstand hard crashes. The receiver battery pack can be easily removed from below the fuel tank by a quick access composite cover at the bottom of the chassis. Optional graphite cover contains a special CNC-machined pocket in which the batteries are placed, allowing the batteries to sit as low as possible. The main feature of the graphite cover is its integrated Multi-Flex Technology™ functionality to additionally reinforce the chassis in the vertical plane. The optional graphite cover is also recommended for use with a LiPo receiver pack. An optional brass battery holder adds weight to the bottom of the car. 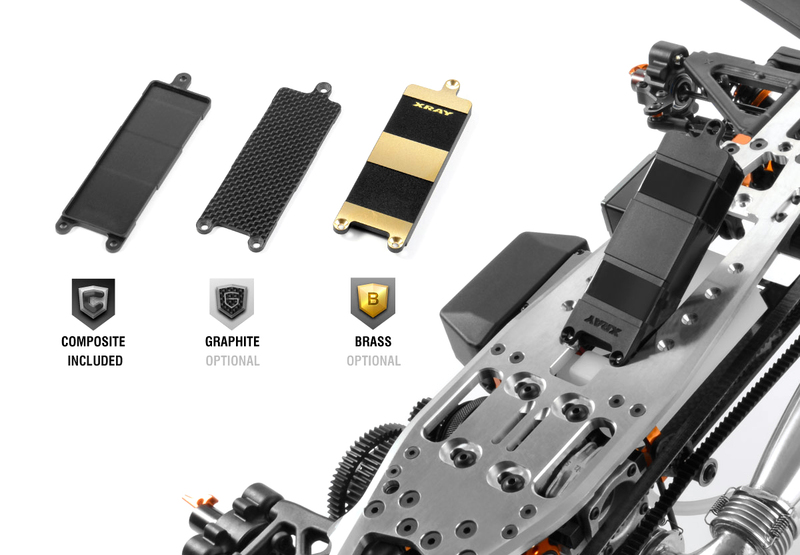 Multi-Flex Technology™ allows the mounting of the optional brass or graphite battery holders either affixed directly to the chassis or mounted independently from the chassis. The compact, lightweight radio case features a clean design and layout. The radio case is attached to the side of the radio plate and will accommodate any standard-size receiver as well as an optional on/off switch with water-resistant rubber cover. 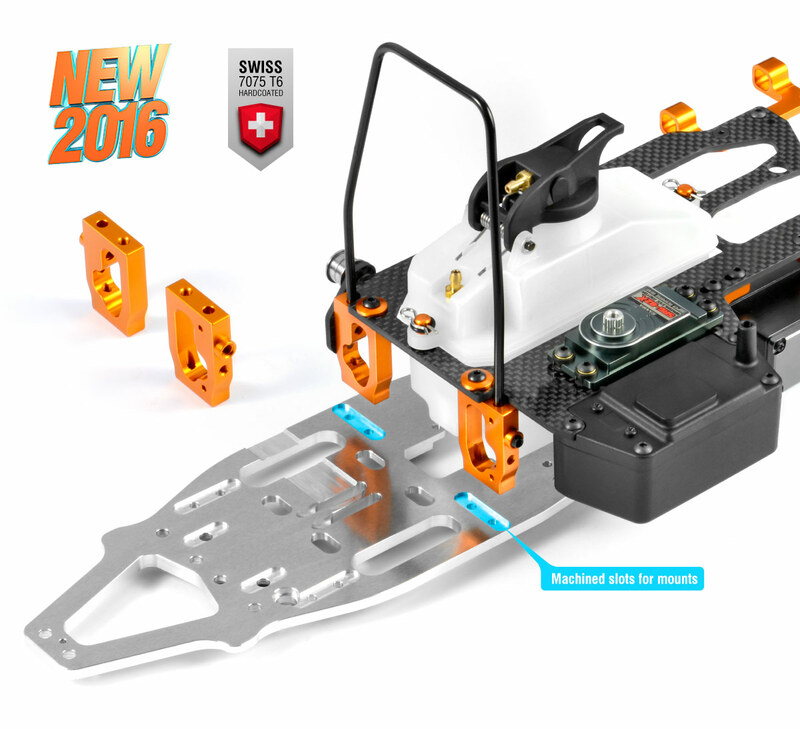 The chassis design focuses on balanced weight distribution and weight transfer. 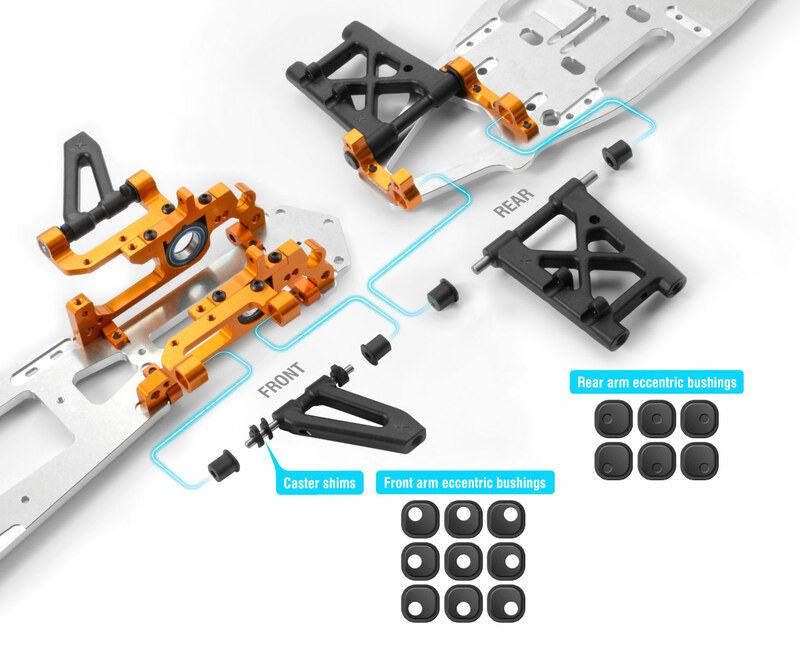 The chassis features pre-drilled holes for additional weights for optimum car balancing. Centerline holes are pre-drilled for easy balancing with the HUDY Chassis Balancing Tool #107880. 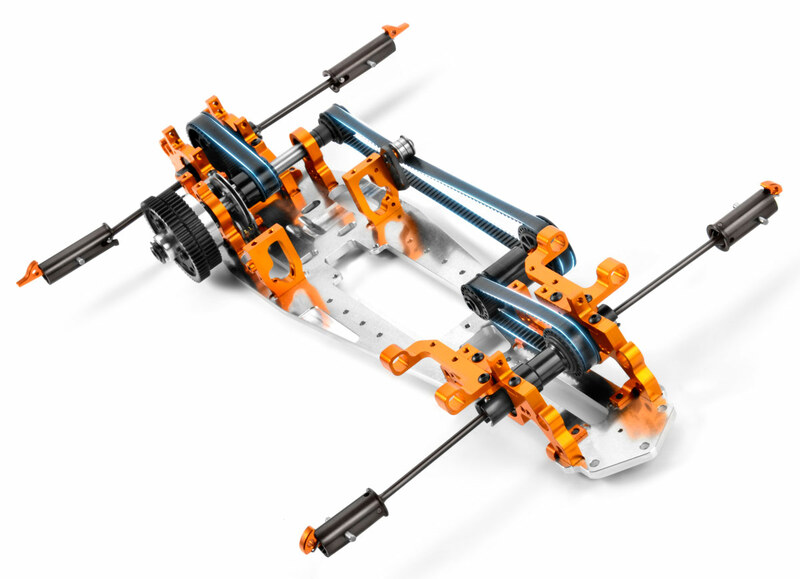 The RX8 features fully-adjustable front and rear suspension geometry: caster, camber, toe, ride height, droop, track-width, Ackermann, roll centers and weight balance. 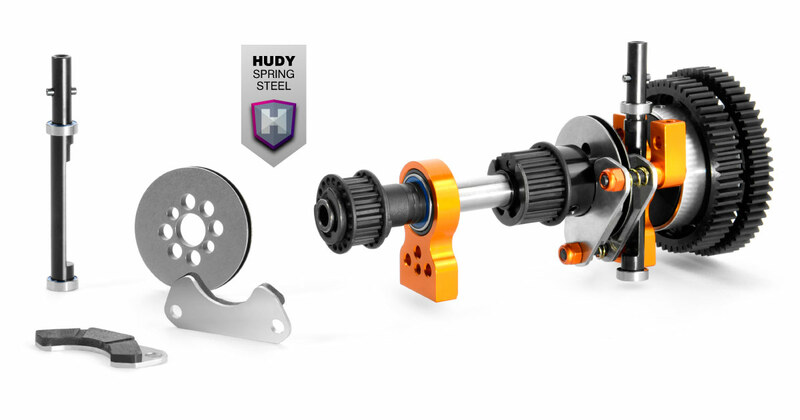 For quick & easy adjustment, we recommend using set-up tools and accessories from HUDY, the world leader of RC tools. 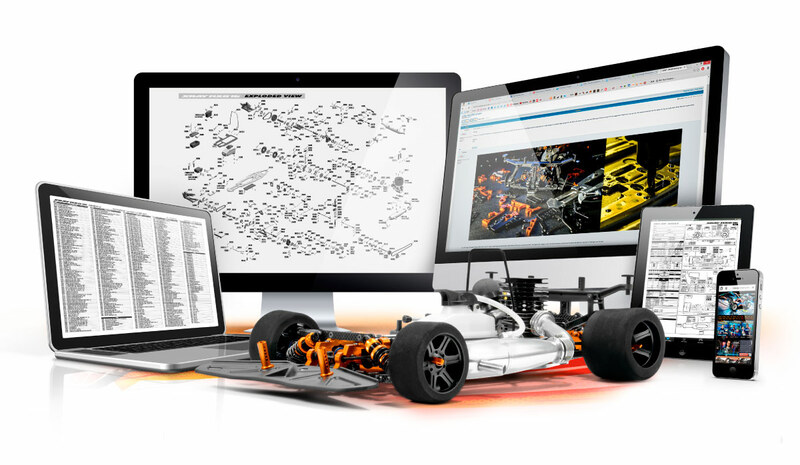 Owning an XRAY model racing car is an experience unto itself. 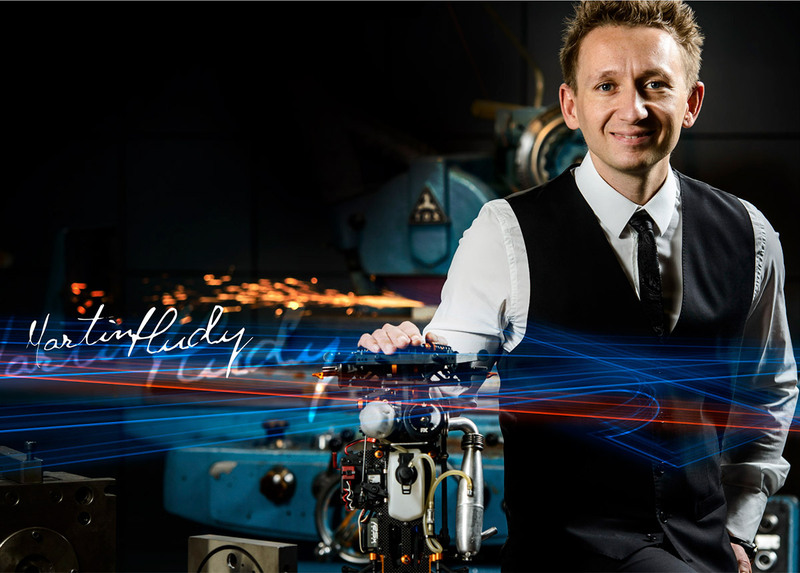 Not only will you own the most premium luxury model racing car in the world, but you will also become a member of the prestigious family of XRAY owners with direct support and service from the XRAY factory. 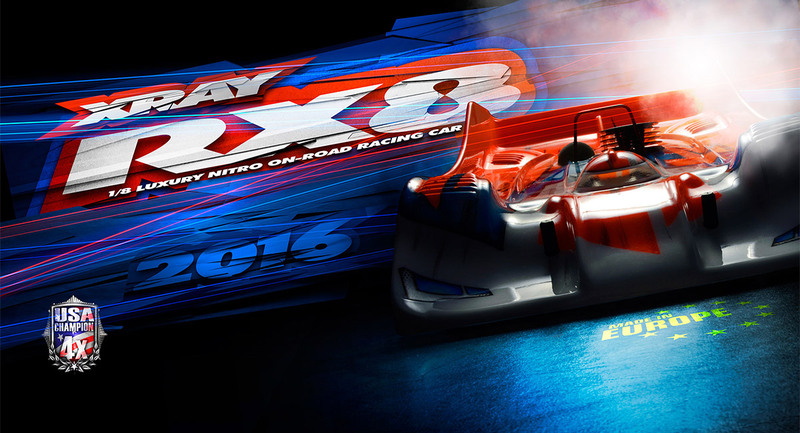 XRAY brings you the most up-to-date RC Web site on the Internet, with daily racing news and the latest product developments. If you have any questions, problems or comments, you can ask the XRAY Support Team or any XRAY Factory Team Driver on the XRAY support forum. You can even upload your own set-up sheets or download from the thousands of different set-up sheets available from around the world at the exclusive XRAY Virtual Set-up Sheet Database. And that is only the start of the VIP treatment you get by joining Team XRAY.